I began my long weekend Friday with an eye appointment, which largely trashed my day due to having my pupils dilated. (The good news is that the eyes look healthy.) I got some things done in the house, but could not venture outside for long until late afternoon. Saturday Cindy headed to Albuquerque with Kira to place flowers on my mother-in-law’s grave, which is as much Memorial Day as we generally do around here. My own father and his people rest in the Paris, Idaho, cemetery, which is generally too far away for me to visit. It’s a beautiful cemetery, on a green hillside overlooking Bear Lake, and I’d like to end up there. (Just not right away.) I spent the day on chores, including planting some more flowers for Cindy. That left Monday for a wanderlusting adventure. 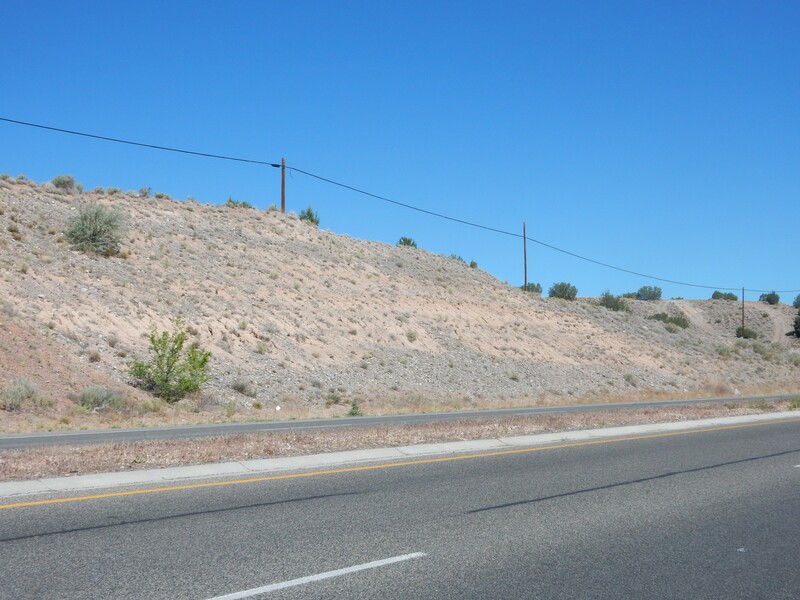 I purchased the most recent New Mexico Geological Society proceedings on the Tusas Mountains not long ago, and I had been thinking about driving one of its road logs for some time. Gary Stradling is on family business this weekend, so I would not have a hiking partner, and this ruled out anything that would take me much off the road or which would take me on bad roads. (Gary has the more suitable gnarly road vehicle.) So this seemed like the right time for the Tusas. The first stop was a road cut north of Espanola. 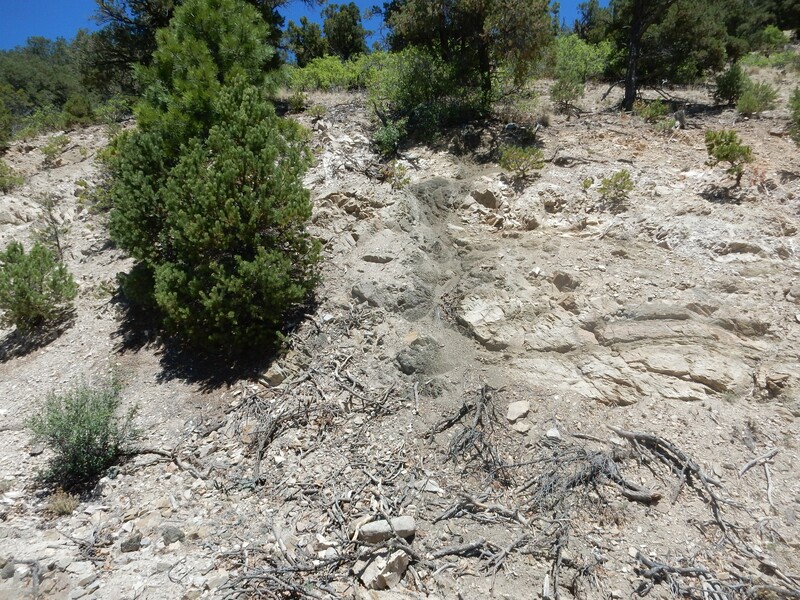 The gravel bed at bottom marks a former level of the Rio Grande, described as the Qtcg3 terrace sediment on the geologic map for the area. 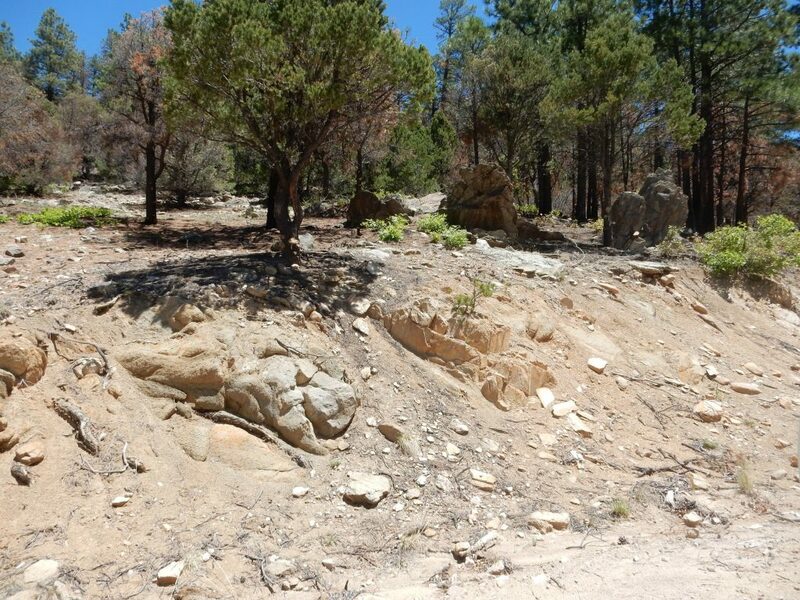 The light beds above are silty floodplain deposits, and to top is sandy gravel containing volcanic debris from the northern Jemez. Yeah, I’m pretty much just warming up the camera at this point. 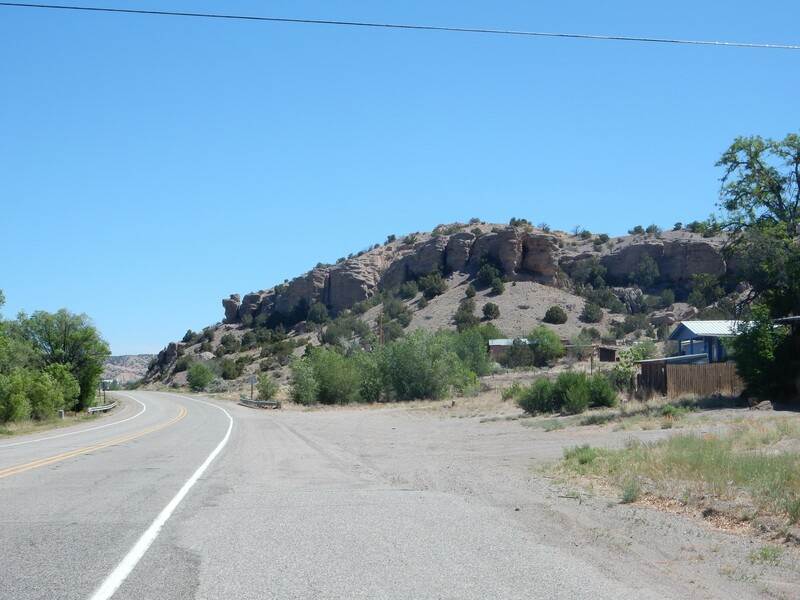 The road continues past the southwestern tip of Black Mesa, then I make my turn onto the highway to Ojo Caliente. Past the turn and northwest of the highway is Cerrito de la Baca. 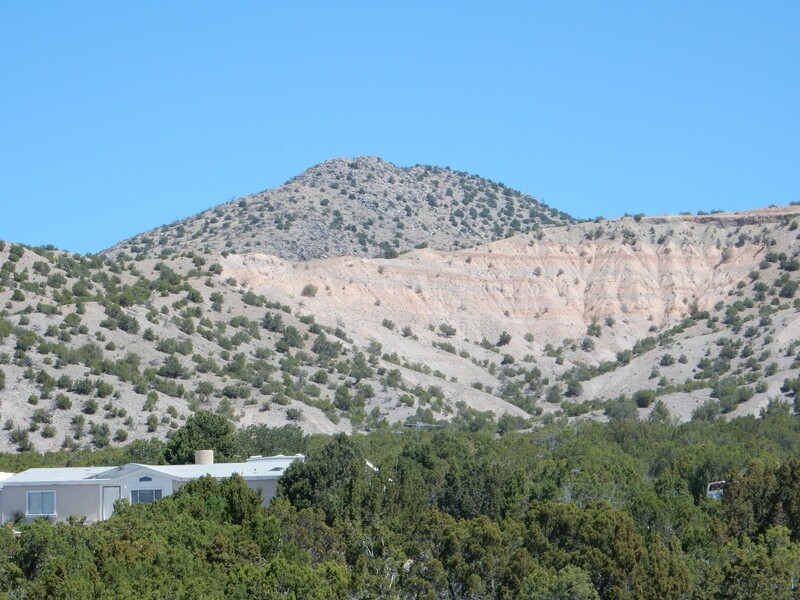 This is a ridge of strongly cemented sandstone of the Ojo Caliente Member, Tesuque Formation, Santa Fe Group. 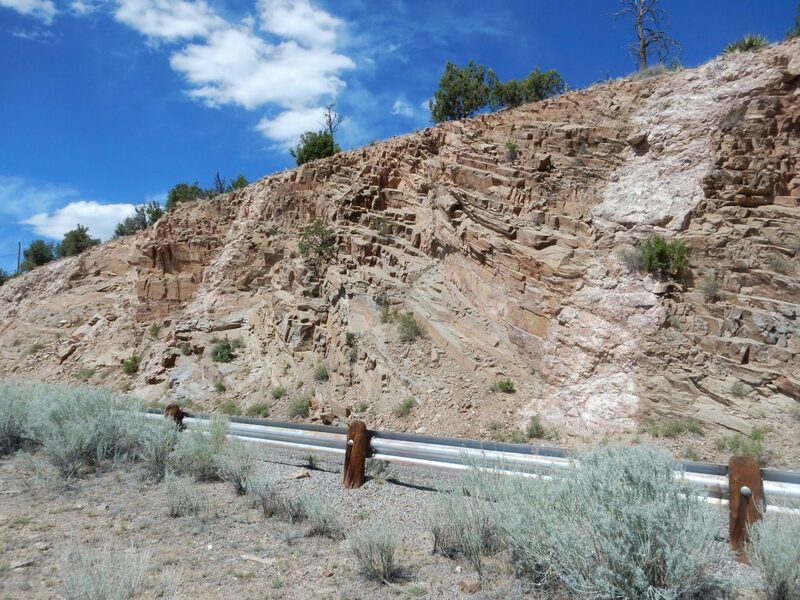 The Santa Fe Group consists of rift fill sediments of the Rio Grande Rift, the great crack in the earth’s crust that reaches from central Colorado to the El Paso area, where it blends into the Basin and Range of northern Mexico. The Rio Grande Rift began opening around 30 million years ago as the Colorado Plateau began pulling away from the rest of North America. It coincides with the Rio Grande Valley along much of its length. The rift filled almost as fast as it opened with sediments eroded off the nearby high ground. 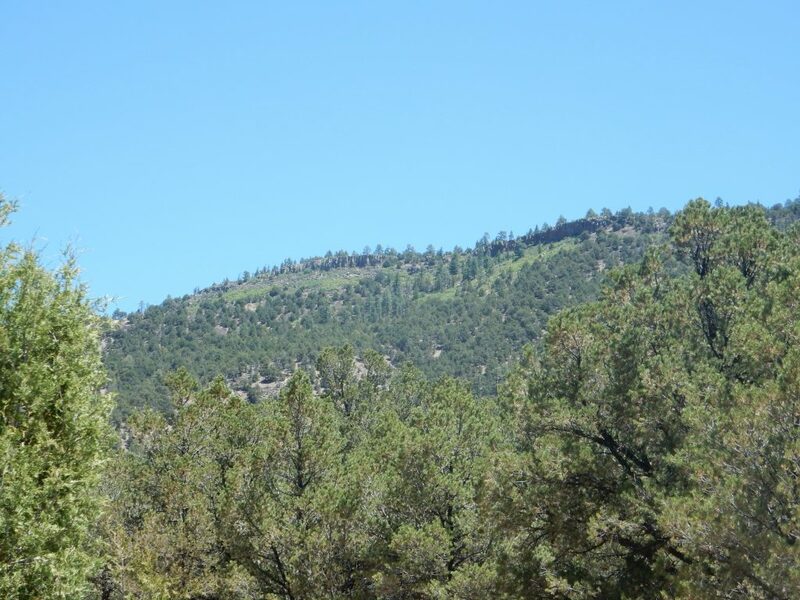 The Tesuque Formation is the chief formation of the Santa Fe Group in the area between Santa Fe and Taos. 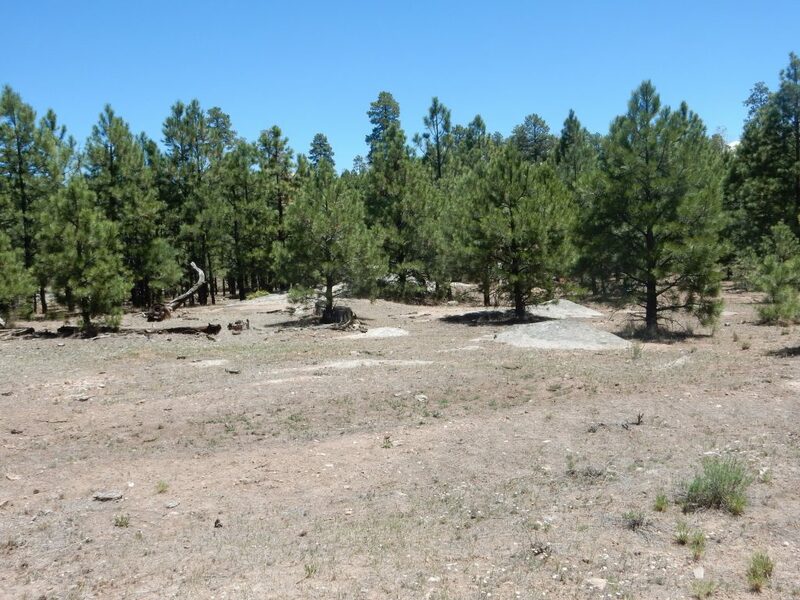 It is mostly sandy, tan, loosely cemented sediments — piles of brown dirt — but there is enough variety for the Santa Fe Group to be divided into a number of members. The Ojo Caliente Member is one of the more distinctive members, since it was deposited as windblown sand in a dune field and so is composed of unusually light-colored, well-sorted sand with little gravel. Most of the other members were deposited by the ancestral Rio Grande or its tributaries. Normally the Ojo Caliente Member is a very soft sandstone, but at Cerrito de la Baca, groundwater has brought in enough silica to strongly cement the sandstone. It was long thought that the ridge marks a fault through which groundwater could more freely circulate, but recent careful mapping shows little displacement of the rock beds across the ridge. Something else must have favored silica deposition here. Across a rise, and Vallito Peak comes into view. This gives its name to the Vallito Member of the Chamita Formation. 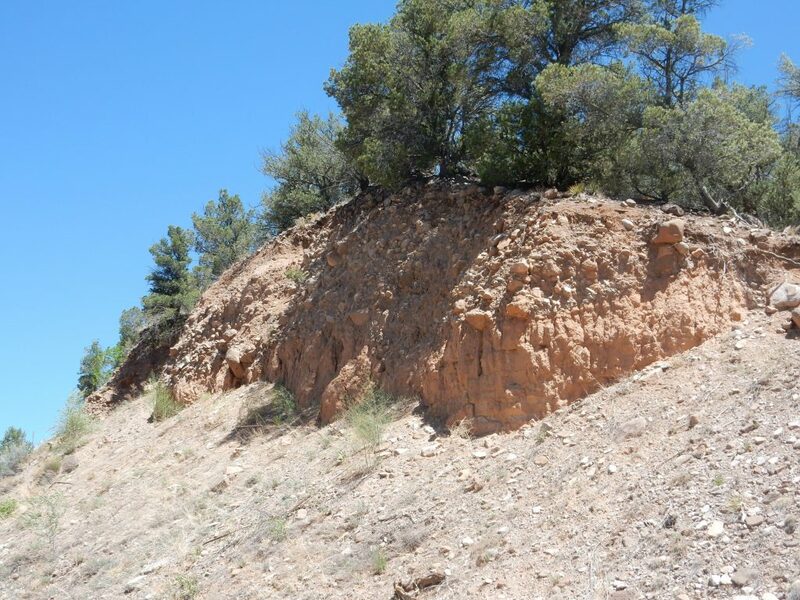 The Chamita Formation is also part of the Santa Fe Group, but is generally younger than the Tesuque Formation, and the Vallito Member overlies the Ojo Caliente Member on the northwest side of Black Mesa. It was laid down by the ancestral Rio Grande and so is distinguished from the Ojo Caliente Member by the presence of river gravel. Well, maybe. 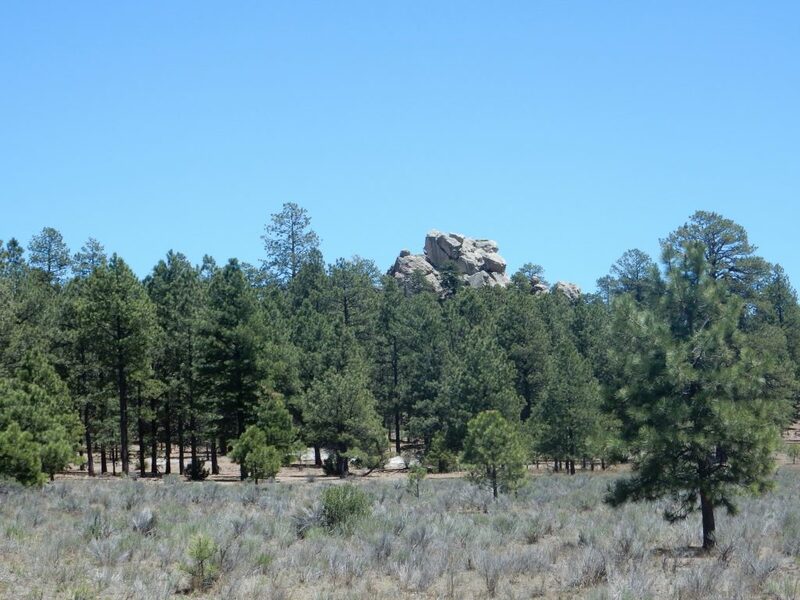 There is disagreement over the member assignments for this area, with one group of geologists going so far as to propose abandoning the Chamita Formation altogether and assigning the upper beds of Black Mesa to the Cieneguilla Member of the Tesuque Formation. I expect this debate will go on for a while yet. 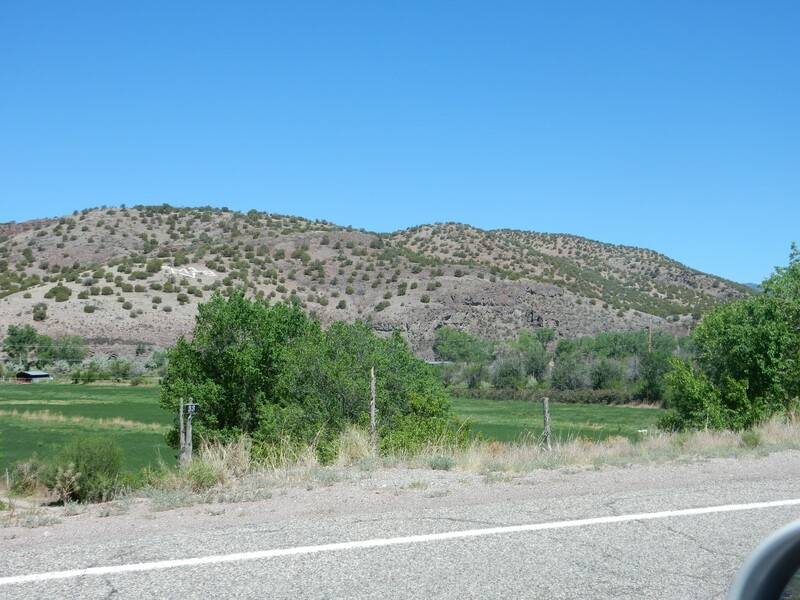 Across the Rio Ojo Caliente to the northwest are badlands of the Chama-El Rito Member. 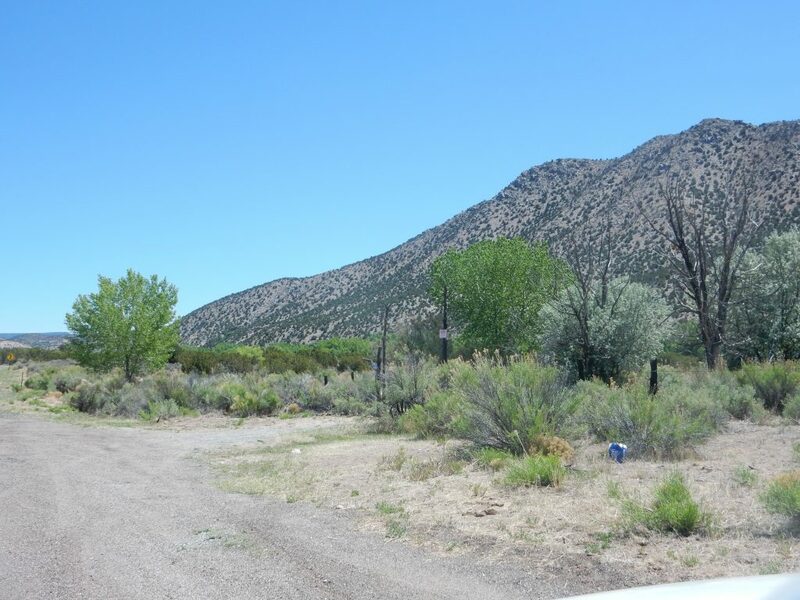 This is generally older than the Ojo Caliente Member and consists of river deposits containing gravel from the volcanoes of the San Juan Mountains to the north. 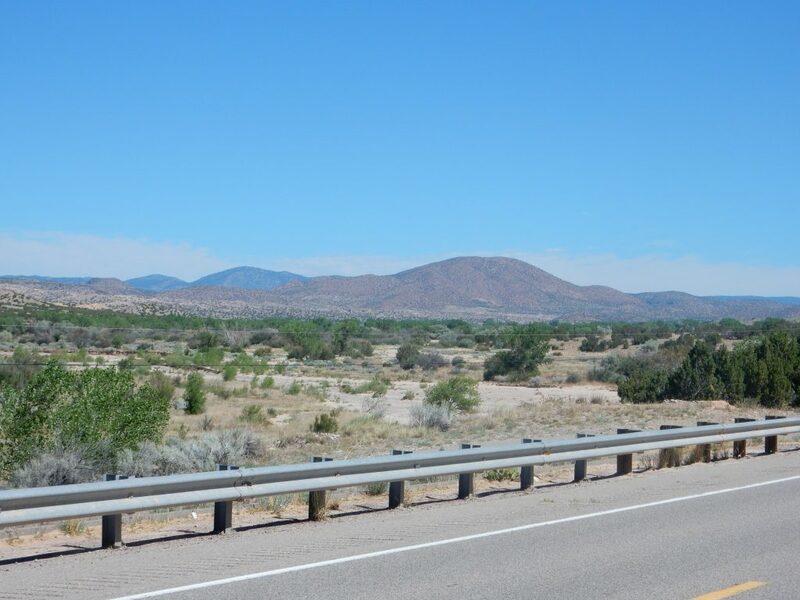 Approaching Ojo Caliente, and Cerro Colorado comes into view. 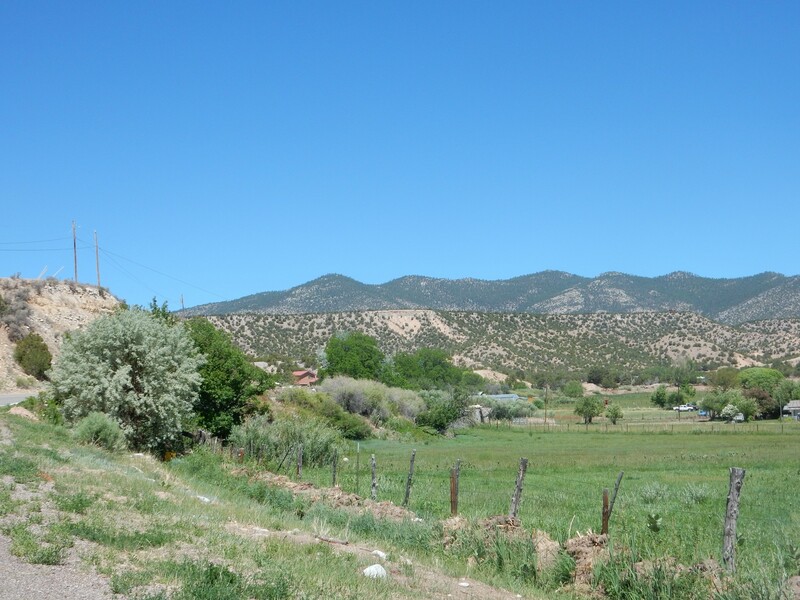 Cerro Colorado is the southernmost outlier of the Tusas Range. It is underlain by Vadito Group metarhyolite, a very ancient rock with a radiometric age of 1.70 billion years. 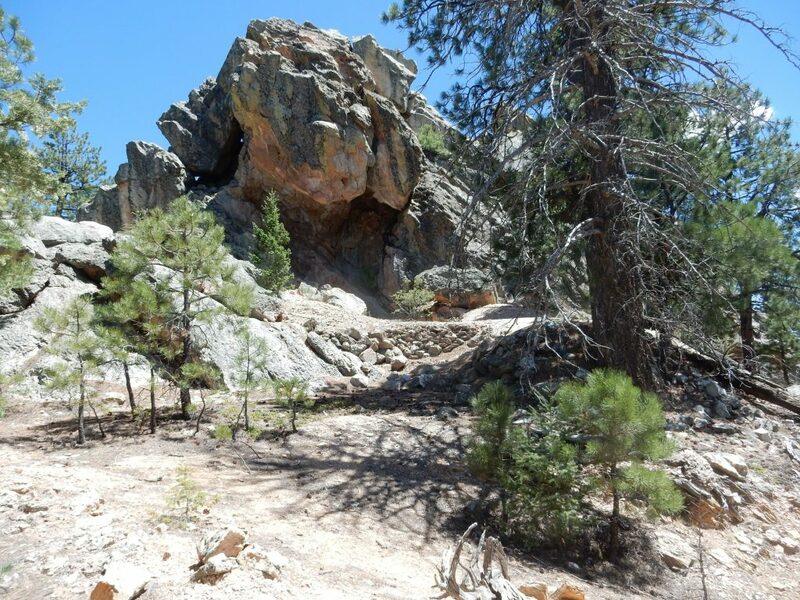 This is rock dating back to the time when juvenile crust was first assembling to form the “basement” of northern New Mexico. Metarhyolite is formed by recrystallization of rhyolite, which was probably deposited as volcanic ash and tuff in a shallow basin. This may have been a back-arc basin associated with ancient plate tectonics. Back 1.70 billion years ago, oceanic crust was subducting under the southern coast of Laurentia, the ancient core of North America. This brought in a large island arc that merged with the continent to form the Yavapai Province, which extends from northern New Mexico to the Wyoming-Colorado border and from Arizona to the Midwest. The ebb and flow of subduction sometimes temporarily pulls a strip of the coast away from the continent, forming a back-arc basin behind the strip of crust. Japan and the Sea of Japan may be a modern example. 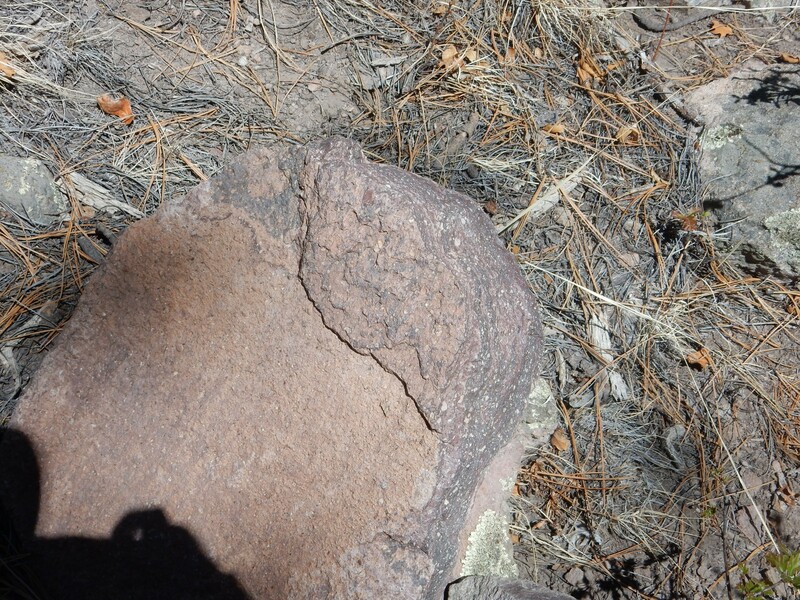 A lot of volcanic activity takes place above subduction zones, and this deposited ash and tuff in the basin. Later, the basin began to fill with other sediments, culminating in deposition of great thicknesses of “mature” sandstone, which is sandstone composed of nearly pure quartz grains. Finally, a second island arc collided with Laurentia, closing the basin, deforming the sediment beds in the basin, and deeply burying them. This recrystallized much of the rock, converting it to metamorphic rock. The second island arc became the Mazazatl Province, which parallels the Yavapai Province, extending from northern New Mexico to northern Mexico and from Arizona to the Midwest. 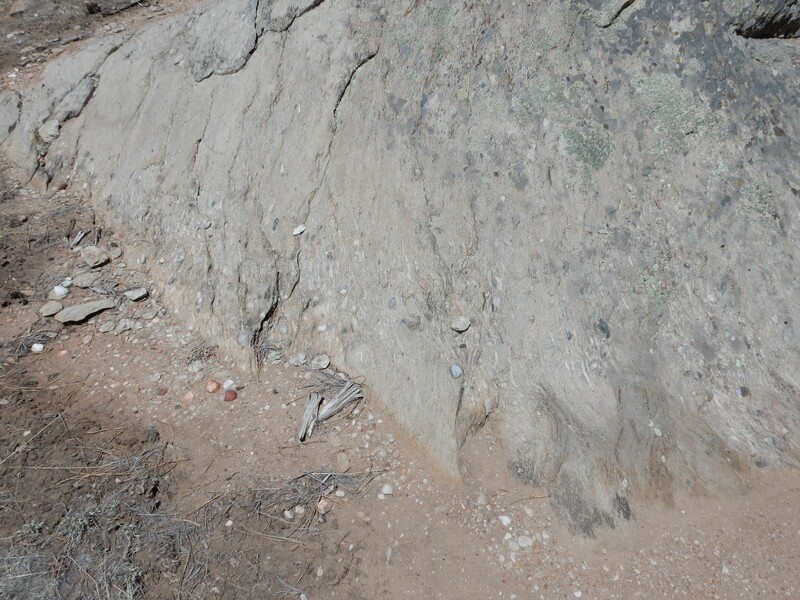 Near here the road cut, which to this point has exposed beds of the Chama-El Rito Member, starts exposing beds of the older Duranes Member of the Tesuque Formation. 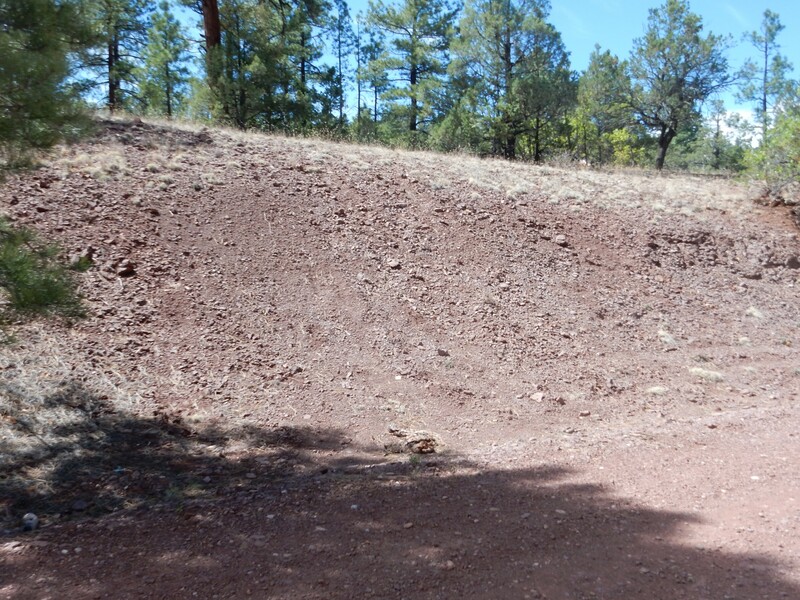 The lighter beds at the top of the road cut (under the layer of young gravel) are Chama-El Rito Member. The darker beds towards the bottom of the road cut are Duranes Member. This member is distinctive for its high content of volcanic gravel. This is thought to be around 22-23 million years old, and to have come from volcanoes west of Taos that must have been fairly sizable, judging from how widespread the Duranes Member is in this area. 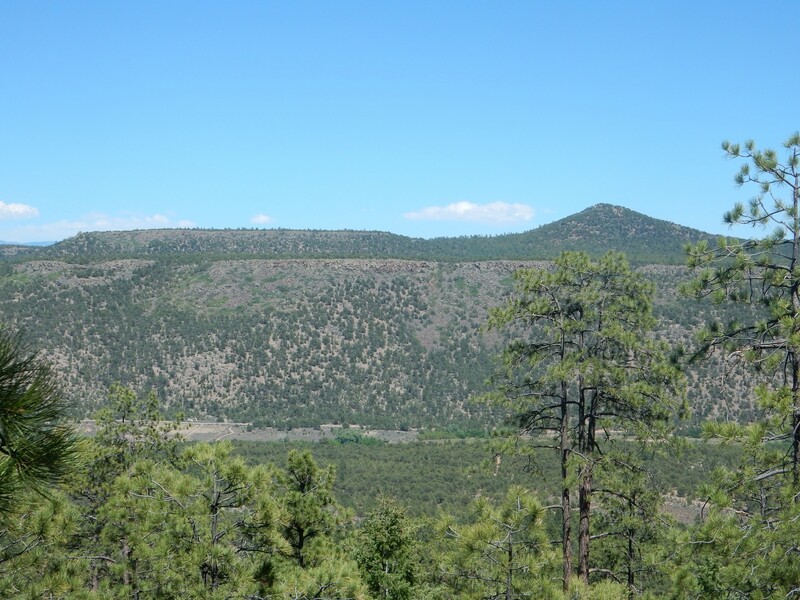 However, the volcanoes were eroded down, then buried under younger Santa Fe Group sediments and the Servilleta Basalt of the Taos Plateau as the Rio Grand Rift continued to open and subside. No trace of these old volcanoes is visible at the surface today. Across the valley to the west is a prominent river terrace. 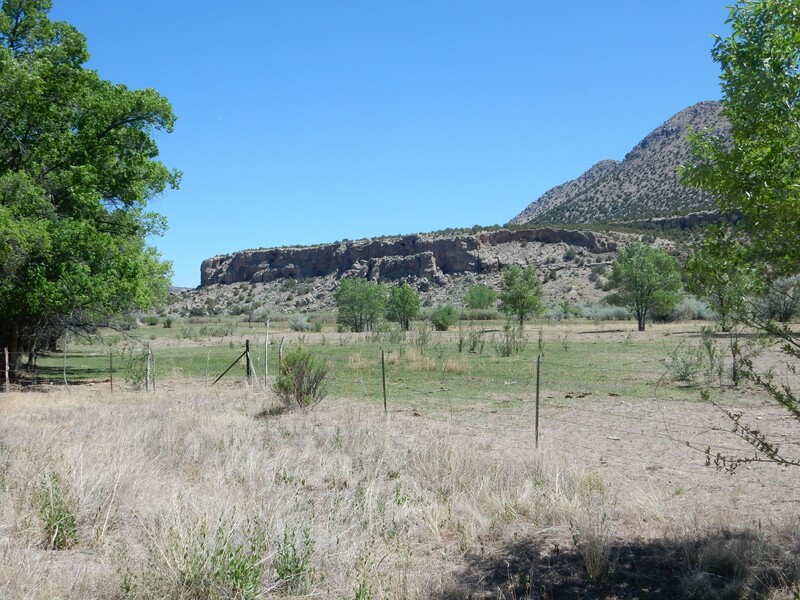 This is part of a former flood plain of the Rio Ojo Caliente, which was abandoned by the river when some change in the river channel downstream caused the river to cut a deeper channel. The entire western United States has been uplifted over the last few tens of millions of years as it has drifted onto the East Pacific Rise, a great upwelling in the Earth’s mantle that is also responsible for the San Andreas Fault. Uplift causes frequent changes in river levels, and up to seven different river terrace levels have been identified in the upper Rio Grande Valley. Each corresponds to a different stand of the river in the past. Further north, there are ruins of Posi Pueblo on this terrace. 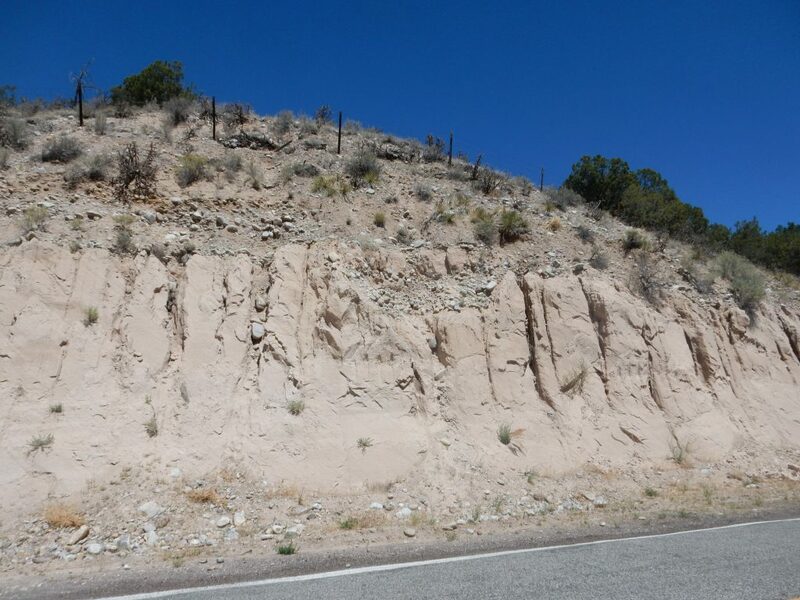 Just north of Ojo Caliente are prominent exposures of well-cemented Duranes Member. A view of Cerro Colorado from the east. Most of the terrain seen here is underlain by Vadito Group metarhyolite. The dark knob in the right foreground is Vadito Group amphibolite, which may be a metabasalt, showing that the volcanic activity that produced the ash and tuff that became the metarhyolite also produced some basalt lava flows. 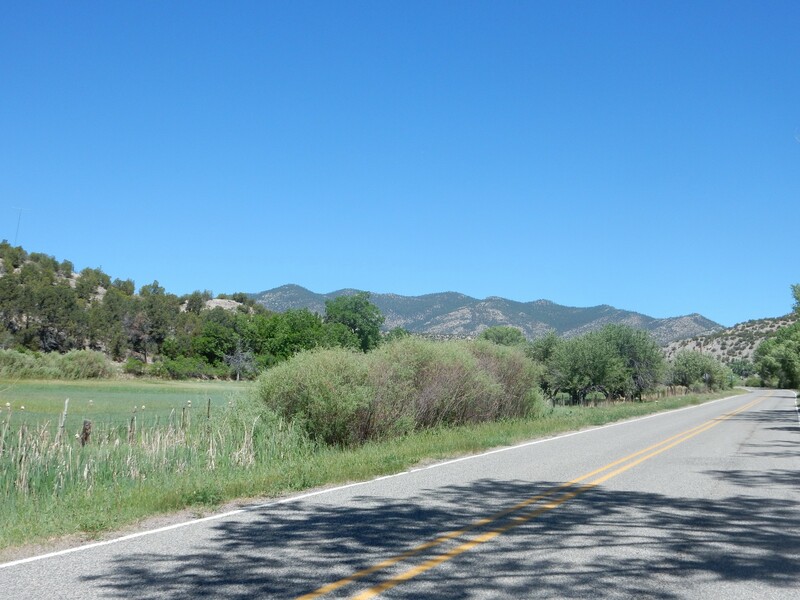 I reach the turn to La Madera and head north as the main highway turns east. To the left, relatively young basalt lava is exposed on a hillside. This has been dated as 23.4 million years old and is likely part of the Jarita Basalt. 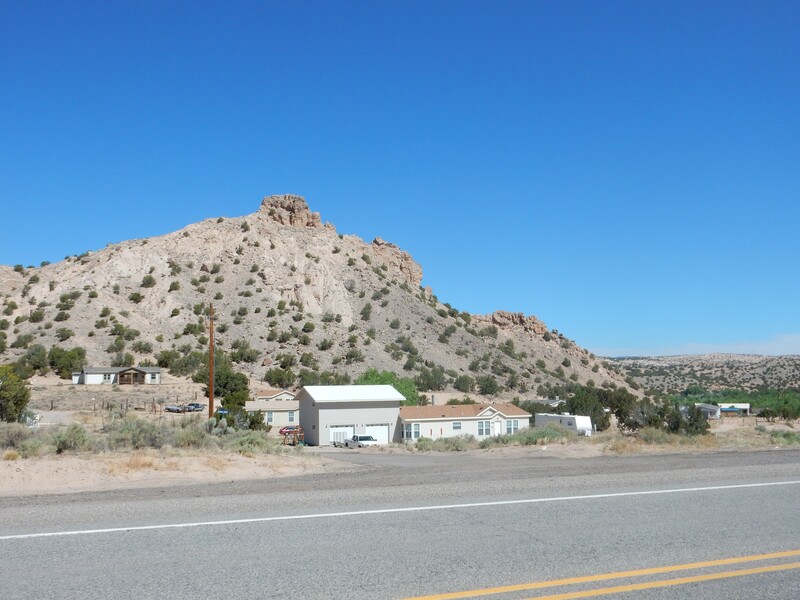 Further down the road, one sees a nice outcrop to the north. This is brightly colored beds of the Chama-El Rito Member sitting on darker beds of the Duranes Member. Around the bend is a high cliff composed of travertine. 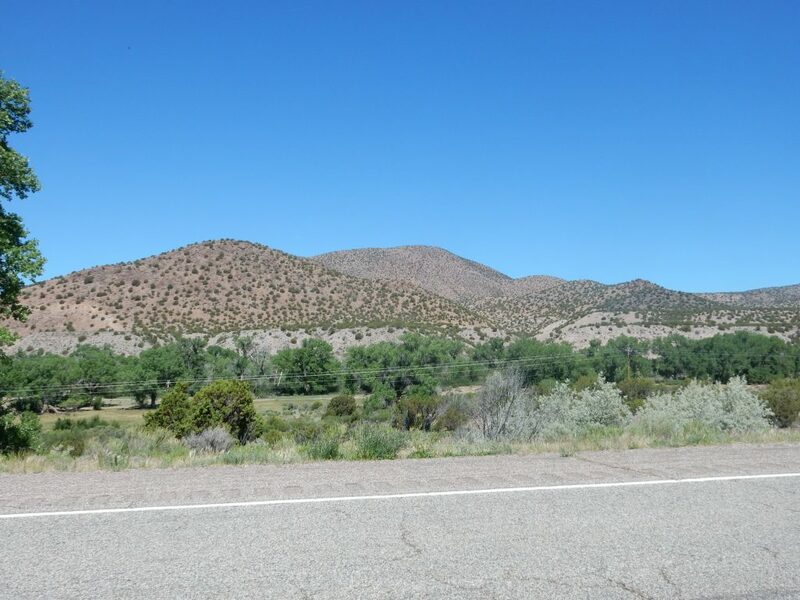 Ojo Caliente gets its name from its hot springs, and there is hydrothermal activity all along the Vallecitos fault, which strikes north through this area. Chemical analysis of the spring waters shows that fluids have risen clear from the upper mantle to the surface here. This particular terrace has an age of perhaps 210,000 years, based on decay patterns of uranium: Uranium deposited in the travertine is relatively free of some of its short-lived daughter products, and the extent to which these have subsequently appeared allows dating of relatively young travertine. I stop to check my blood sugar (106; not terrific but still pretty good), eat my orange, and make an offering to the forest fertility gods. 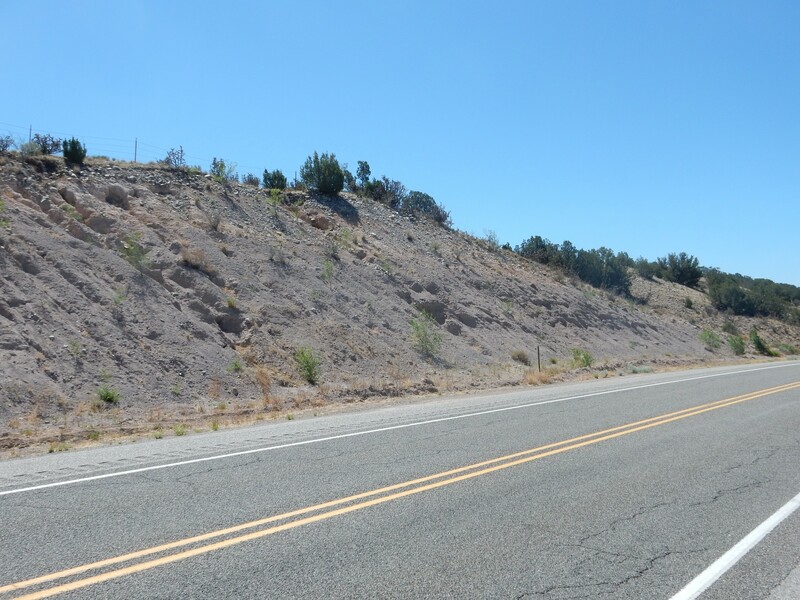 Resuming the drive, I come to a point where the western slope of the La Madera Mountains shows the trace of the Vallecitos fault. The lower slopes of the mountains are essentially the face of the footwall of the fault. 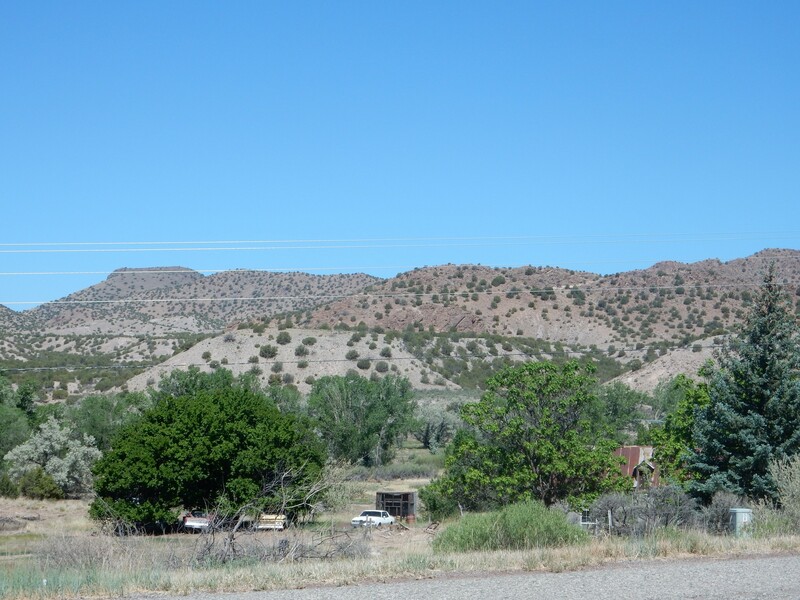 The mountains are underlain by Ortega Quartzite of the Hondo Group. 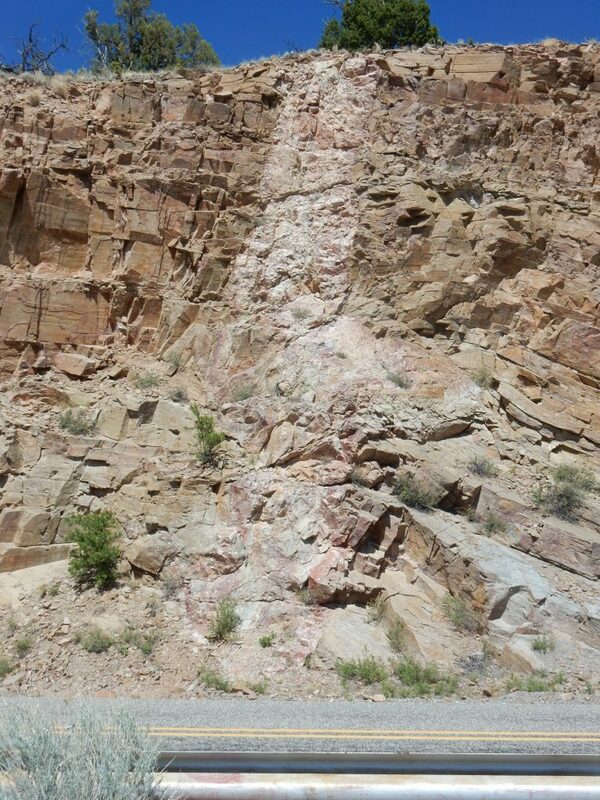 This is the very clean sandstone deposited in the Yavapai back arc basin, now metamorphosed to quartzite. It contains zircons eroded from the source rock for all that sand, and these peak in age around 1.723 billion years ago. 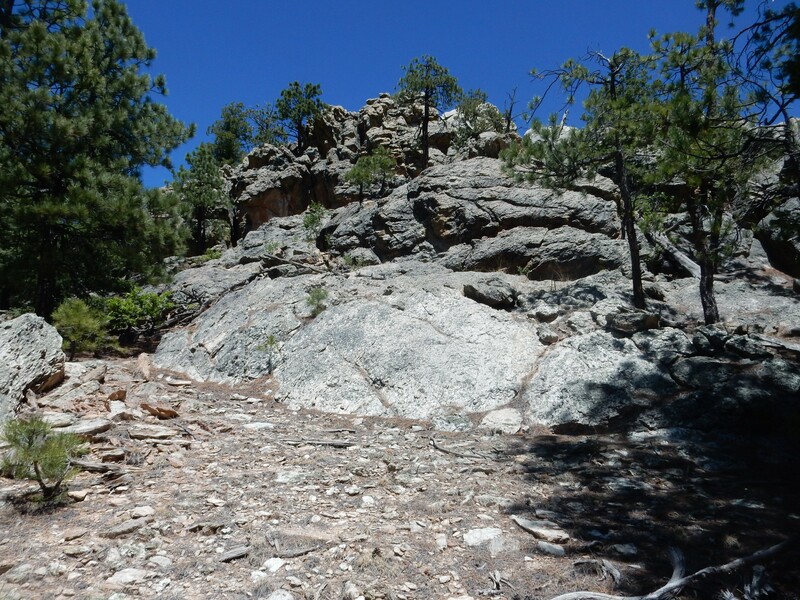 However, the youngest are 1.688 billion years in age, the likely time of deposition of the Ortega Quartzite, and a few are 2.771 billion years old — likely weathered from Archean rocks far to the north, in Wyoming. Passing some beds of Ojo Caliente Member just south of La Madera. The bright sun has somewhat washed out the details, but there is prominent cross bedding in this outcrop. The cross beds dip at a sharp angle to the north and betray the origin of these beds as eolian deposits, laid by wind in a dune field. North of La Madera, the Ortega Mountains come into view. By a stunning coincidence, these are underlain by great thicknesses of the Ortega Quartzite. The road approaches a prominent river terrace. This is mapped as the fifth and most extensive of five terrace levels in the valley of the Rio Vallecitos, and is thought to be about 600,000 years old. The river has cut downwards an average of 330 feet since then. Further on, impressively distorted quartzite beds come into view to the northeast. 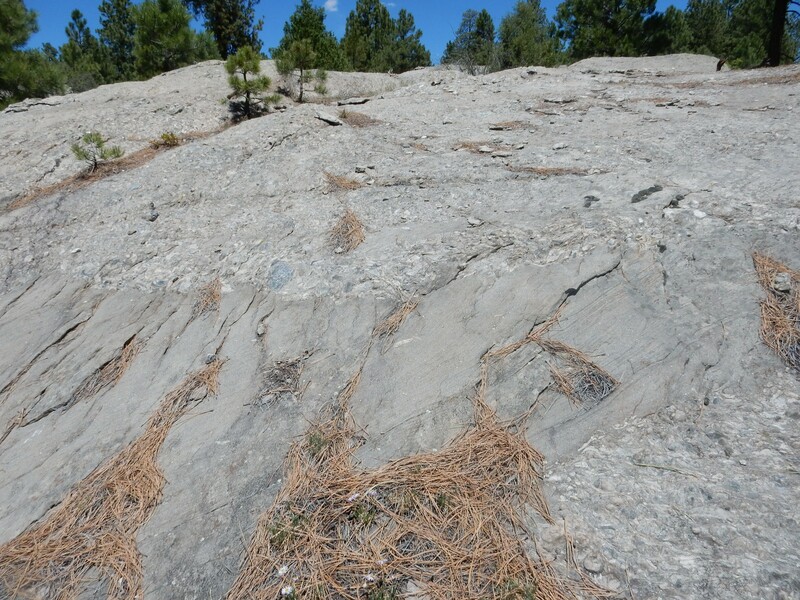 The surface remains remarkably flat due to being the footwall of the Vallecitos Fault. 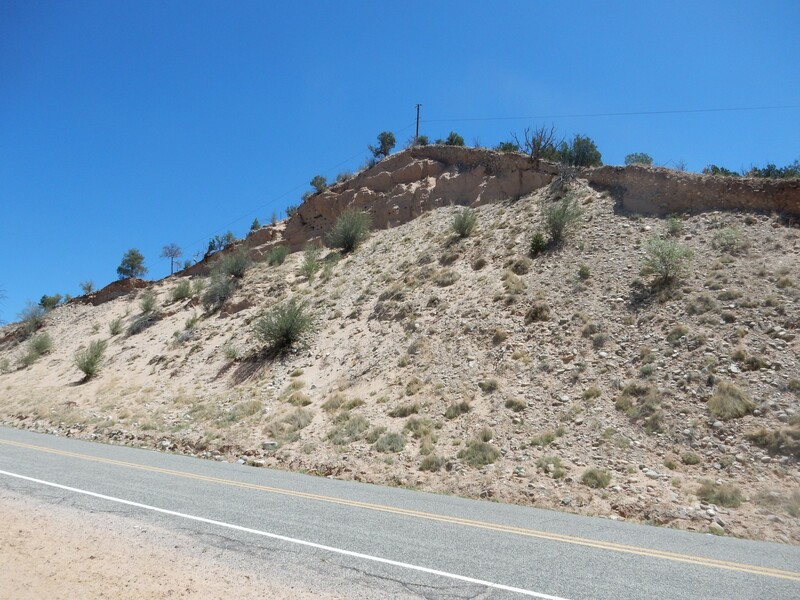 I pull over at the first stop recommended in the road log, across from some nice deposits of the Tesuque Formation. These are mapped as gradational between the Chama-El Rito Member and the Ojo Caliente Member. That would meant that these beds were deposited as the streams in this area began to dry up and be buried by windblown sand, somewhere in the ballpark of 12 million years ago. Following the instructions in the road log, I scramble up this ridge from the south (SPOT-3 in my back pocket) and take a look around. The panorama starts looking to the north, up the valley of the Rio Vallecitos. 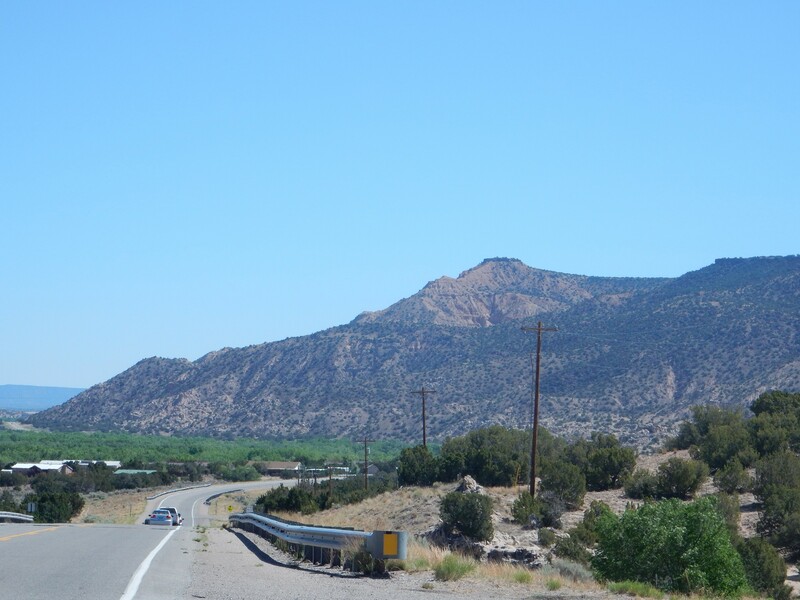 To the left of the valley are the foothills of the Ortiz Mountains, and to the right is the southwestern crest of Mesa de la Jarita. Towards the south are the La Madera Mountains, in the distance, and then Cerro Colorado just peeking over the river terrace. There is something curious about the river course here, called out in the road log. I head east for a good look. The Rio Vallecitos has cut a deep gorge through the highly resistant quartzite … rather than cutting through very soft Santa Fe Group sediments just a few hundred yards to the west. Well, it’s not like rivers are actually guided by beautiful young naiads; the river is an impersonal force of nature that cannot “know” that there is softer ground just a little ways from its bed. The river may originally had run along the fault zone at the foot of the mountain, and cut straight down into the quartzite as the region continued to be uplifted. It seemd appropriate to photograph a sample of the quartzite on my way back to the Wandermobile. This is pretty typical of the Ortega Quartzite — almost pure quartz, with just a few bands containing some black magnetite and an occasional thin bed of sillimanite, aluminum silicate, formed from traces of clay in the original beds. 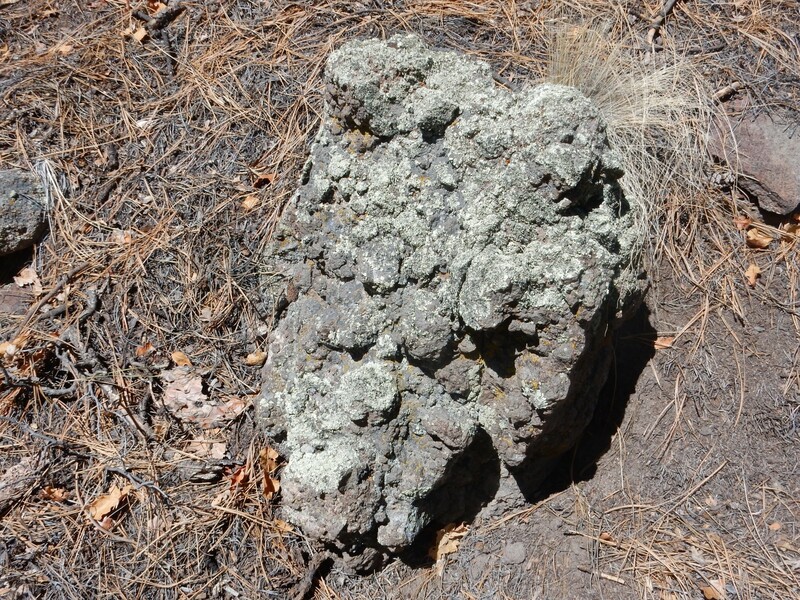 The appearance is somewhat variable, as the rock can weather to a dull orange as the magnetite is oxidized by the elements. 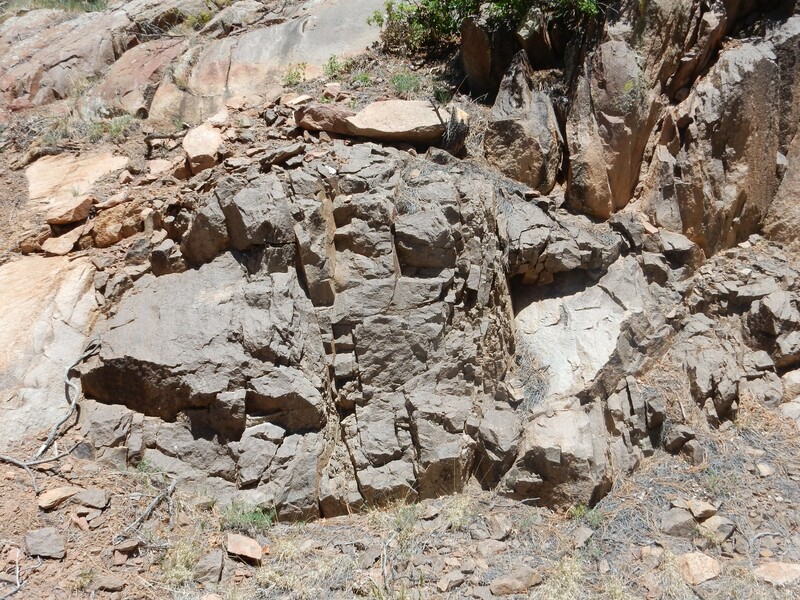 Further up the road, we see an example of how highly distorted the rock beds became when Mazazatl collided with Laurentia almost 1.7 billion years ago. 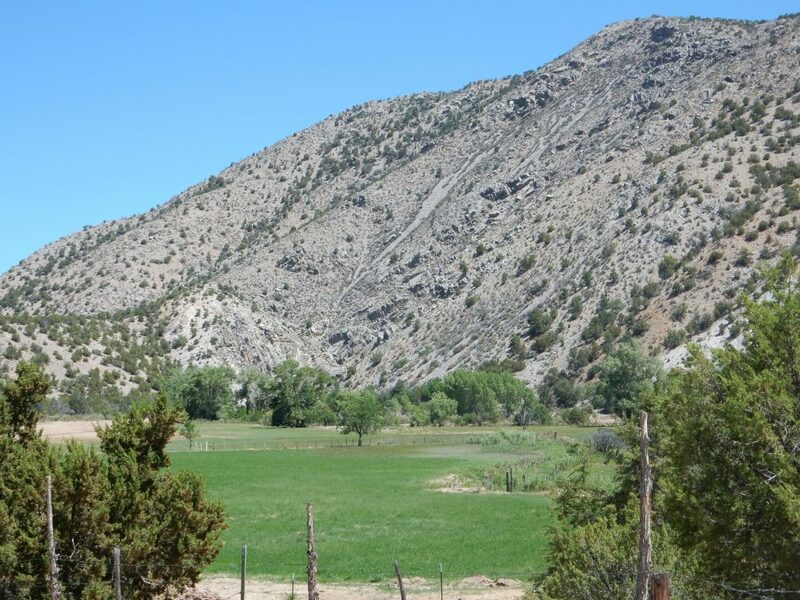 The western crest of Mesa de la Jarita continues to be defined by the Vallecitos fault, but here the side of the crest is divided between a micaceous quartzite on top and darker amphibolite on the bottom. Both are assigned to the Vadito Group, which was laid down before the Ortega Quartzite. 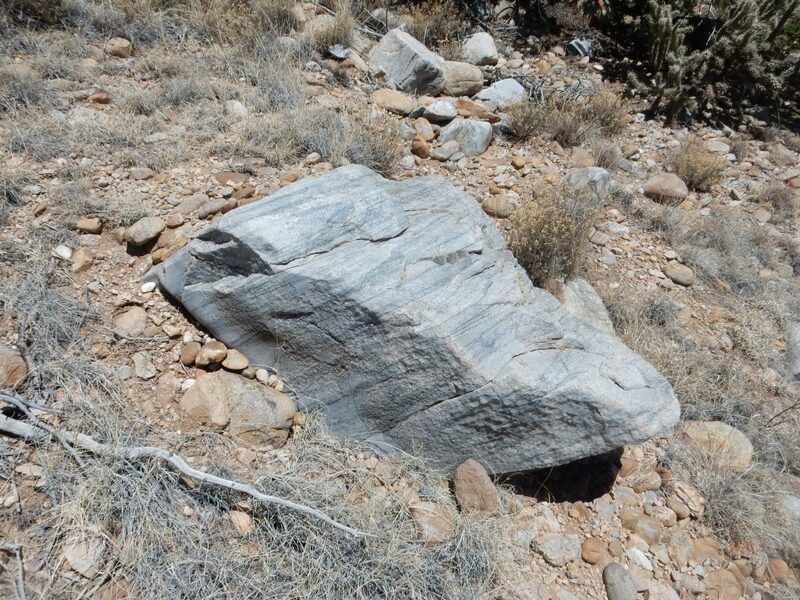 The quartzite here is a lot less clean (hence the mica content, from clay in the sediments) and may be identical with the Marquenas Quartzite in the Picuris Mountains to the east. The amphibolite could well be metamorphosed basalt from early in the opening of the back arc basin. Next, some nice orange beds of the Chama-El Rito Member just outside Vallecitos. You may be thinking: This is a long ways from the Rio Grande Valley. Yes. Yes, it is. The Rio Grande Rift is much wider than the Rio Grande River Valley, starting off as a broad, shallow downwarp in the crust. Sediments were deposited well into the foothills of the bordering ranges — as took place here. A glimpse of Jarita Basalt atop Mesa de la Jarita. 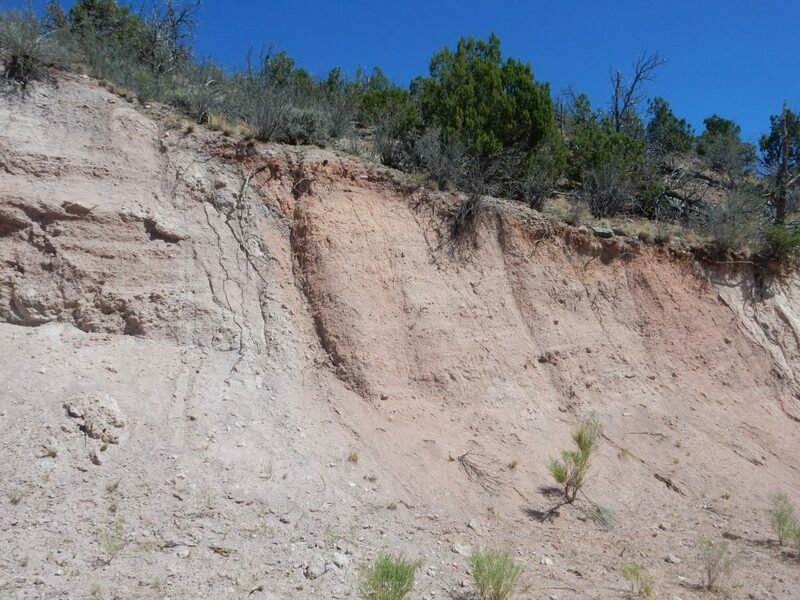 “Jarita Basalt” is a kind of grab-bag assignment, taking in what are probably many distinct flows of different ages that have in common only the fact that they are interbedded with Santa Fe Group sediments. This flow may be around 22-23 million years old. The old Vallecitos sawmill, once the heart of the local economy. 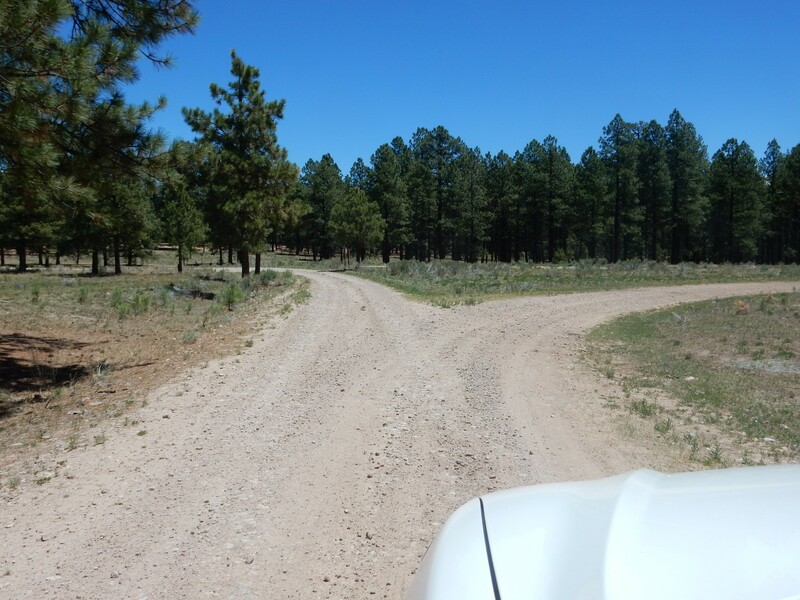 I turn onto Forest Road 447, which ascends the west face of Mesa de la Jarita. Here I leave the paved highway, though this is an excellent, well-maintained gravel road. 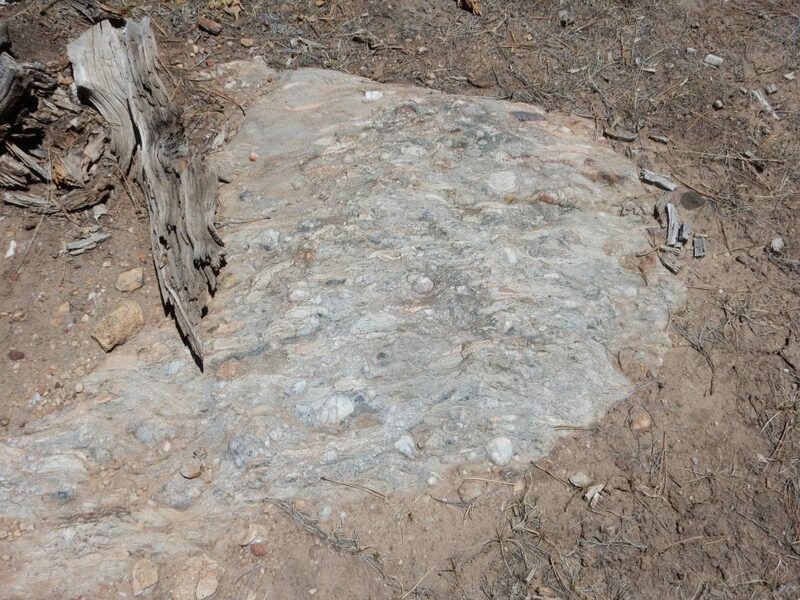 A bed of micaceous schist (the crumbly-looking stuff) between beds of Ortega Quartzite. Muscovite mica is a marker for the presence of clay in sediments that were subsequently metamorphosed. Just up the road is an amphibolite dike. This is mostly hornblende, but with some feldspar and large flakes of dark biotite mica. This was likely a basalt dike before it was metamorphosed. The amphibolite weathers easily, so that amphibolite dikes tend to look crumbly in texture. 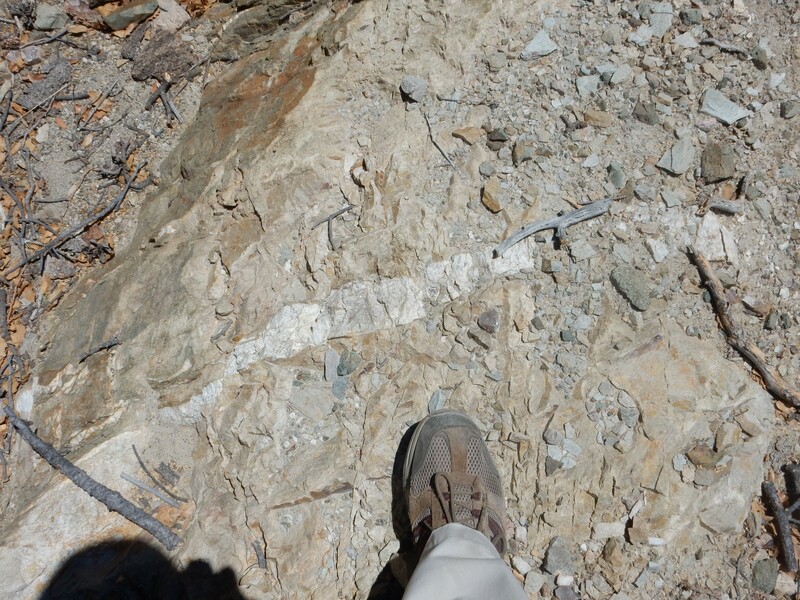 On the ground below is a small pegmatite vein that has been neither metamorphosed nor weathered. Like the Cerros Colorado metarhyolite, this was formed from ash flows — bedding can still be discerned in some locations — and is about 1.70 billion years old. My camera chose this point to lose its GPA lock, so I had to go with dead reckoning here. My first glimpse of the Big Rock Conglomerate, of which we’ll see much more later. Judging from the map, this should be Big Rock Quartzite. 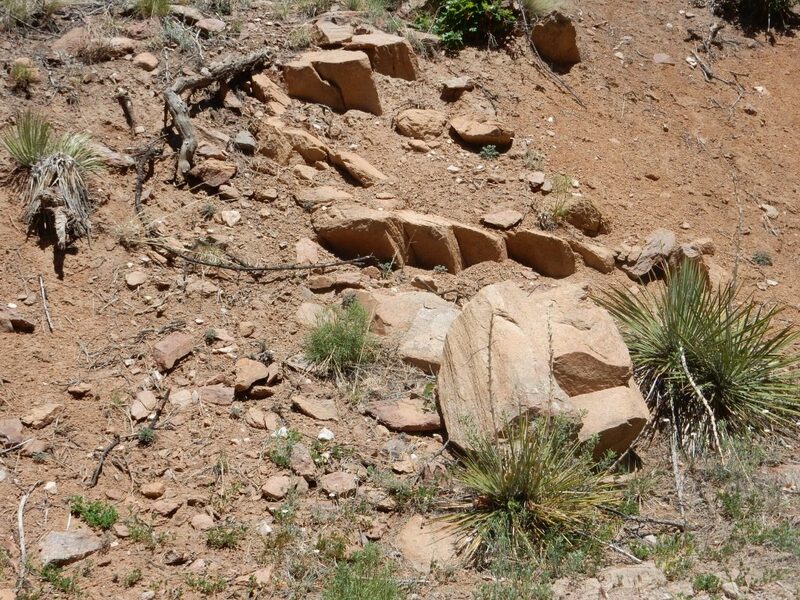 You can see relic crossbedding preserved in this metamorphosed sandstone. If that’s what it is; the road log also mentions metarhyolite in this area. This I dunno. 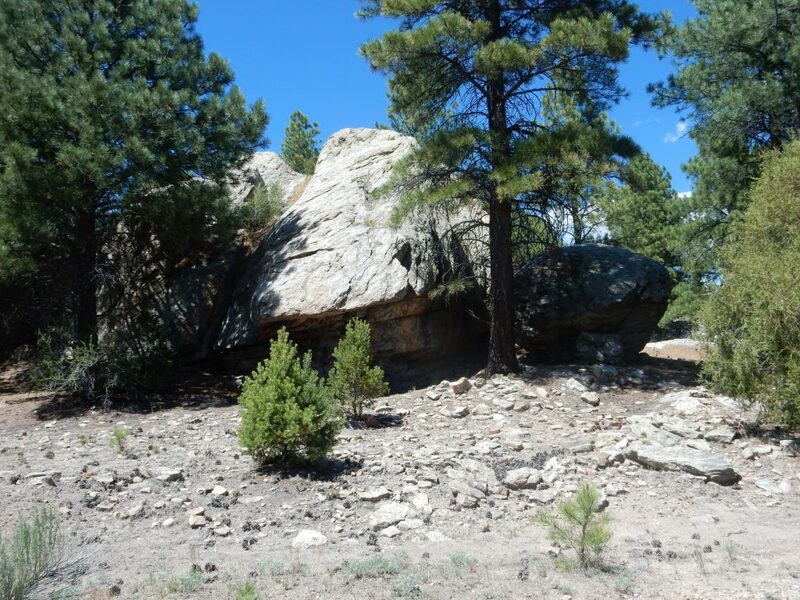 The road log doesn’t clearly identify it, but it’s in an area mapped as Big Rock Quartzite, and it does look like a massive quartzite. The white patches look like individual crystals of feldspar. That doesn’t help much. No yellow wood nearby, and neither is grassy and wanting wear. I, I took the road the road log instructed me to, to the right. The road passes more of the Big Rock Conglomerate, one of the more distinctive formations of the Vadito Group. 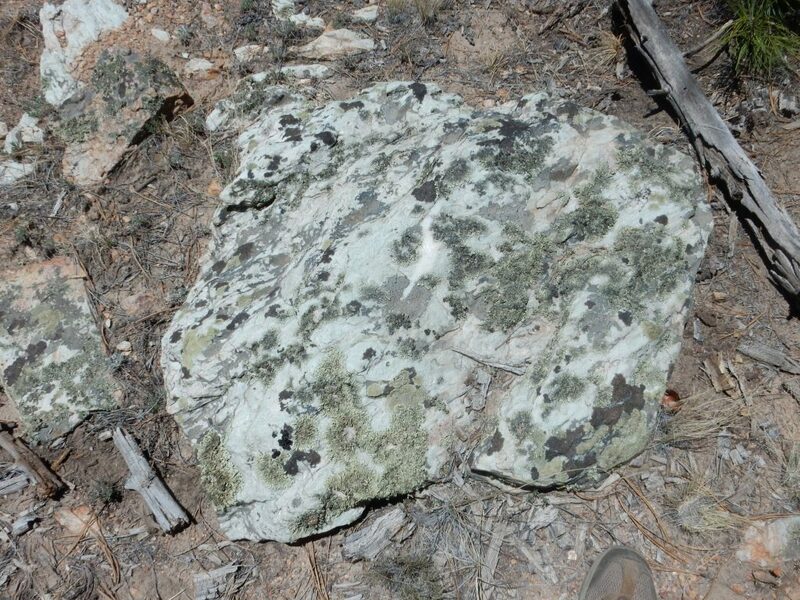 Notice that the conglomerate is highly foliated, showing it was strongly compressed and deformed. However, there are numerous large quartz pebbles in the conglomerate which are almost undeformed. This shows the rest of the rock was much softer than the quartz. This likely was gravel in river channels in a muddy floodplain, probably close to volcanoes erupting silica-rich ash. I drive to the second recommended stop in the road log, next to a fenced experimental agriculture area. There is more of the Big Rock Conglomerate to the north, which I am encouraged to investigate by the road log. Here is some conglomerate rich in matrix. Perhaps this was a siltier part of the original sediment beds. 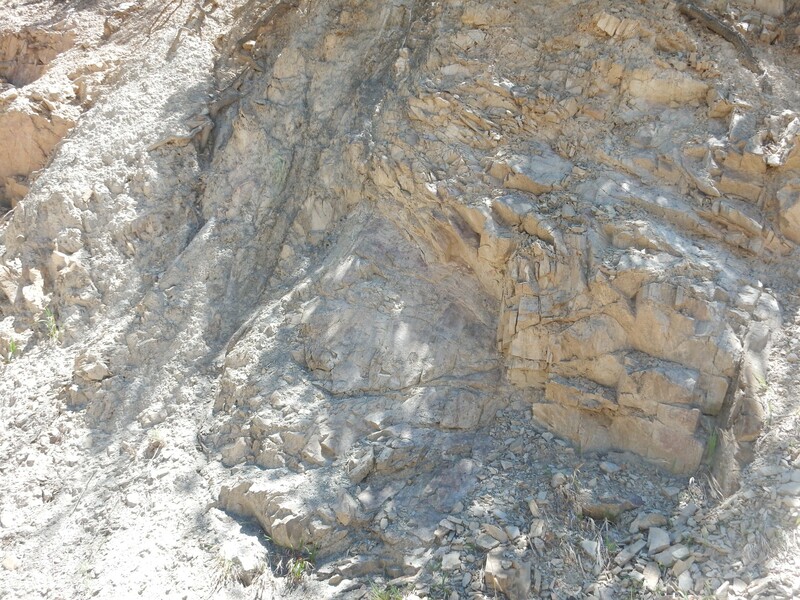 Here is what looks like a small pegmatite dike penetrating the conglomerate. Nearly pure white quartz is exposed over a small area. Here is a contrast between river channel gravel and a silt bed, all now metamorphosed. 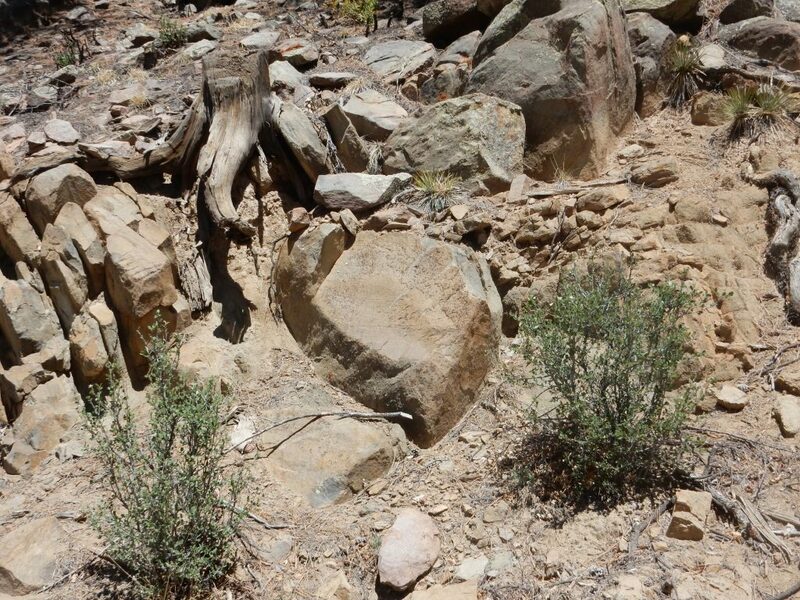 I had been scouting for an outcrop where there was some indication of the original bedding. This is the best I found. The next cool thing to see at this stop were plugs of kyanite schist, one of which was once mined for kyanite. One is visible above the trees. Kyanite schist forms from clay sediments, rich in aluminum, that have been heavily metamorphosed. This produces kyanite, an aluminum silicate mineral. This is a particularly choice specimen purchased in a rock shop. The mineral gets its name from its pale blue color — which is not actually a sure indication of the mineral; totally pure aluminum silicate is colorless, and kyanite can come in a variety of other colors, though pale blue is particularly common. Notice the silky appearance of the long, columnar crystals. There are two other minerals with the same composition, sillimanite and andalusite, stable under different conditions. Kyanite is the low-temperature, high-pressure version, while sillimanite is the high-temperature, high-pressure version and andalusite is the medium-temperature, low-pressure version. I have sillimanite in my collection; I suppose I’ll have to find some andalusite now, for completeness. Anyway, it’s especially satisfying to have a sample of mineral you collected yourself rather than purchasing in a shop. I was hoping to find some here. To be sure, i was not sure what I should be looking for; I doubted I’d find anything as obvious as my rock shop sample. So I hiked over to the middle of the three knobs. 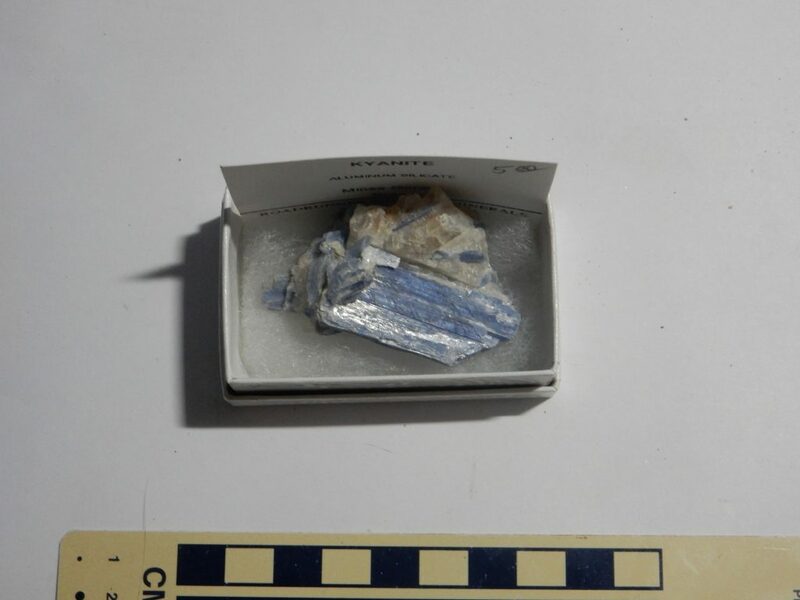 The pale blue-green color is unusual and suggestive of kyanite. However, the rock appeared to be quartz. If there’s kyanite here, it’s finely disseminated through the rock. Here’s the knob up close. 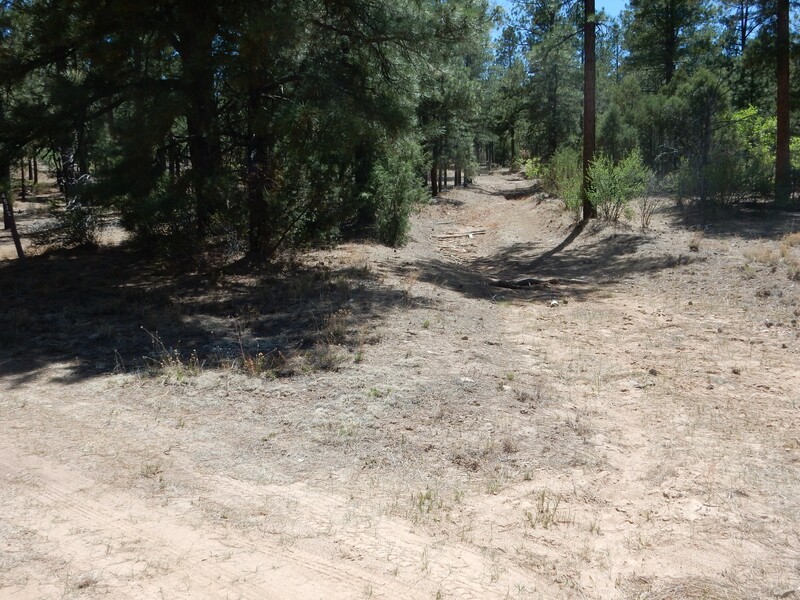 The flat ground in the foregrouns turns out to be a decades-old road. I follow it around the knob, finding what look like piles of tailings on each side. The road ends at a prospect. 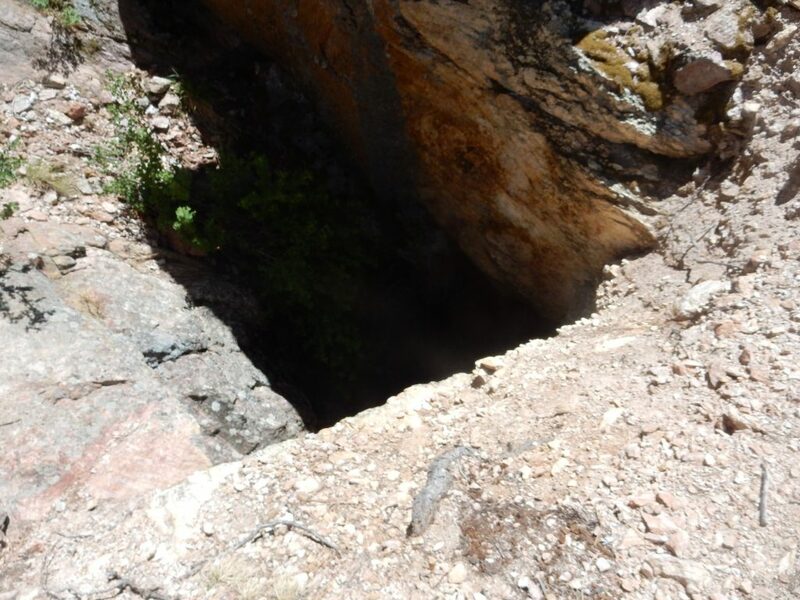 This is a pit that was dug to look for kyanite. That the prospect was abandoned is not a good sign. I look around; through the trees I can see that there would be a great view from atop the knob, into the Rio Tusas valley to the east. However, the climb to the top of hte knob would involve some serious scrambling, and I’ve gotten more cautious about trying to kill myself since last fall, even when I’m carrying a SPOT-3. I refrain. At the eastern base of the knob is some seriously sheared rock. 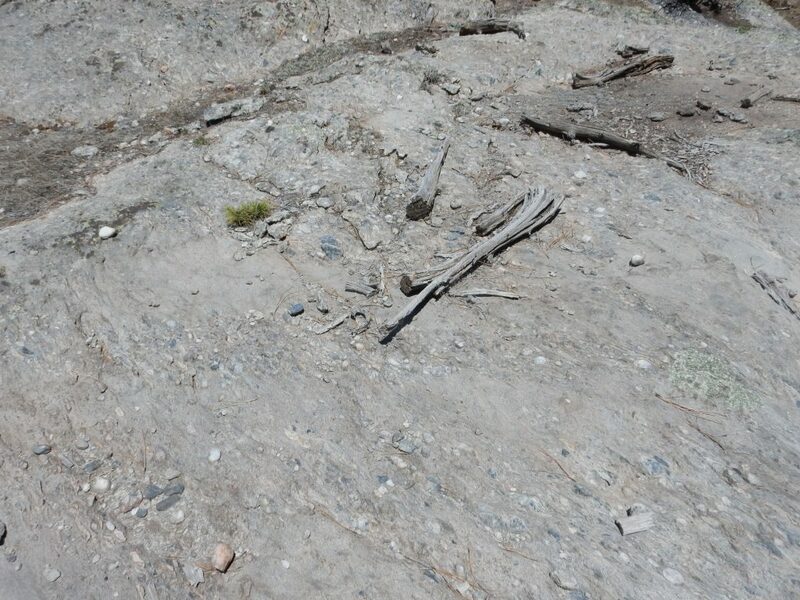 This looks like a fault trace, and the road log mentions a shear zone along the kyanite schist knobs. This must be it. I walk to the next knob, where the mine works are obvious. The mine operated in the 1920s. I’m surprised the road is still this obvious. The shaft is lovely, dark and deep. But I have promises to keep, and I can just imagine the frosty reception if Cindy knew I had done something as reckless as trying to enter an old mine. (They’re extremely dangerous.) But there are plenty of tailings around, and I soon collect some treasures. Not as spectacular as my rock shop sample, but it’s definitely kyanite. 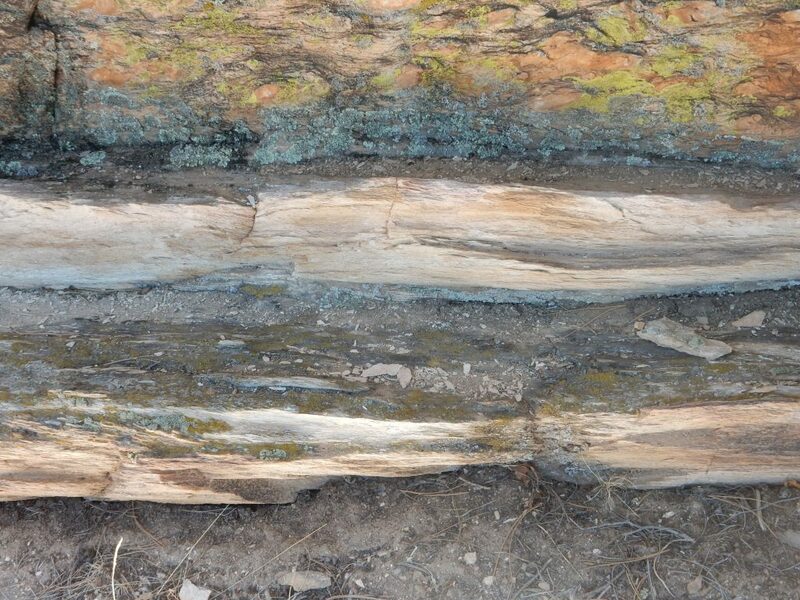 There is a hint of the pale blue color, and the fibrous appearance is diagnostic. Well, that was pretty cool. I walk back to my car, eat lunch, and proceed to Stop 3 on the road log. This takes me a ways back into the countryside, but the road remains passable. 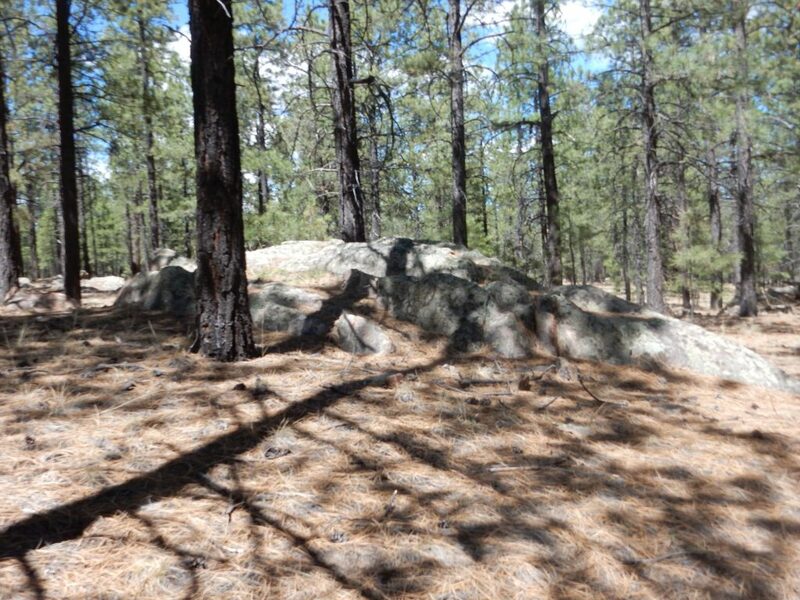 I hike southwest of the road as directed by the log, guided by my camera, to an arroyo rim. The geologic map assigns no name to this flow, but the log calls it the Pena Tank rhyolite flow. 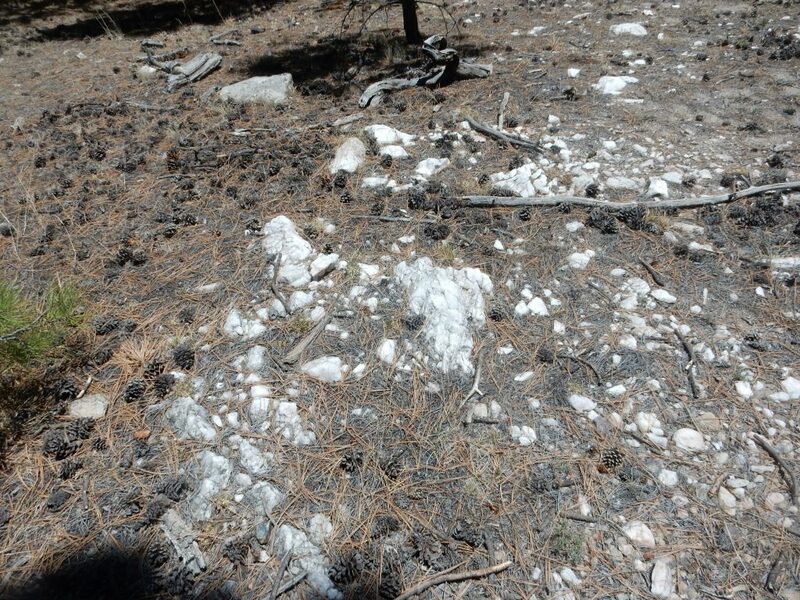 The rock is a silica-rich rhyolite with many phenocrysts of feldspar (the white dots); these crystallized in the rhyolite while it was still underground. Another view. A block that shows brecciation, likely from the time the flow was cooling and its outer crust broke up into blocks. 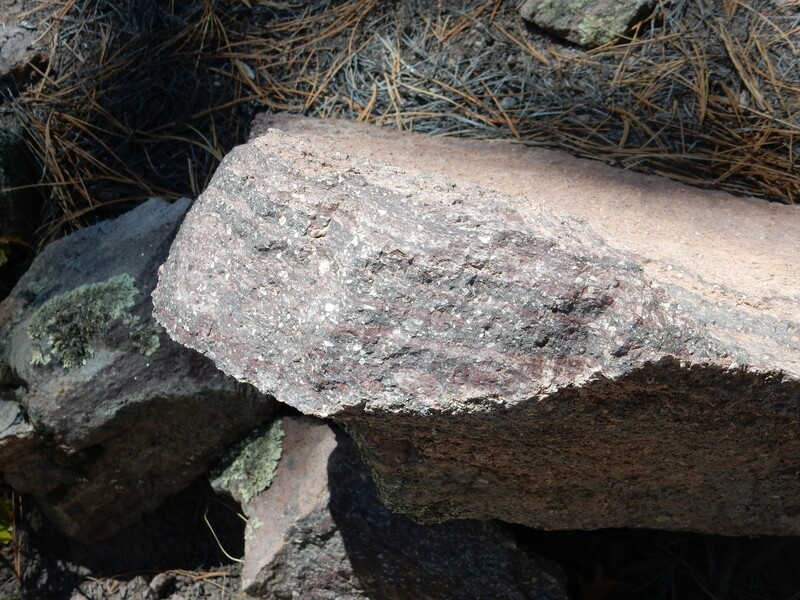 I didn’t find good examples, but below this red rhyolite is a white rhyolite that resembles the famous Amalia Tuff of the Taos area. 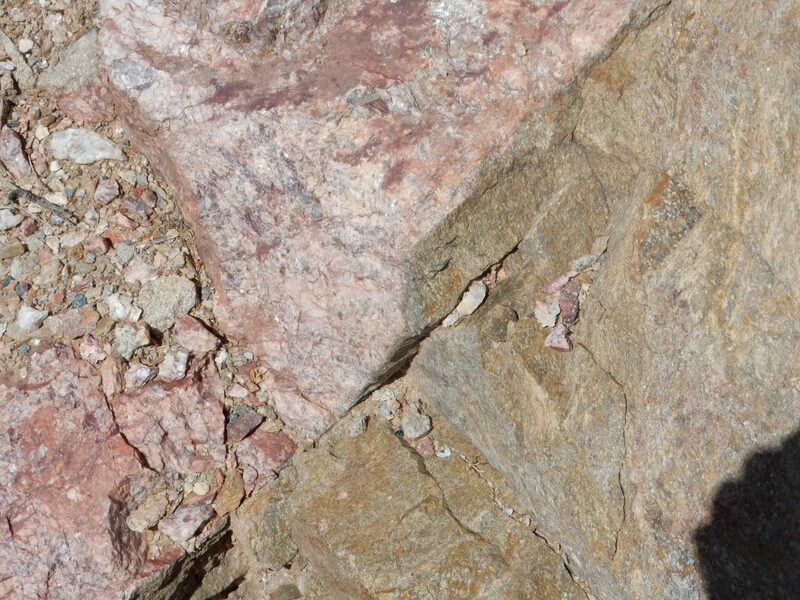 The red rhyolite has a radiometric age of around 22.7 million years, while the white rhyolite has an age of 25 milion years (about the same as the Amalia Tuff) — the difference is greater than the precision of the dating, so there’s little doubt the white stuff is older. But pods of it are found in the red rhyolite, and these appear to have been liquid when the red stuff crystallized. 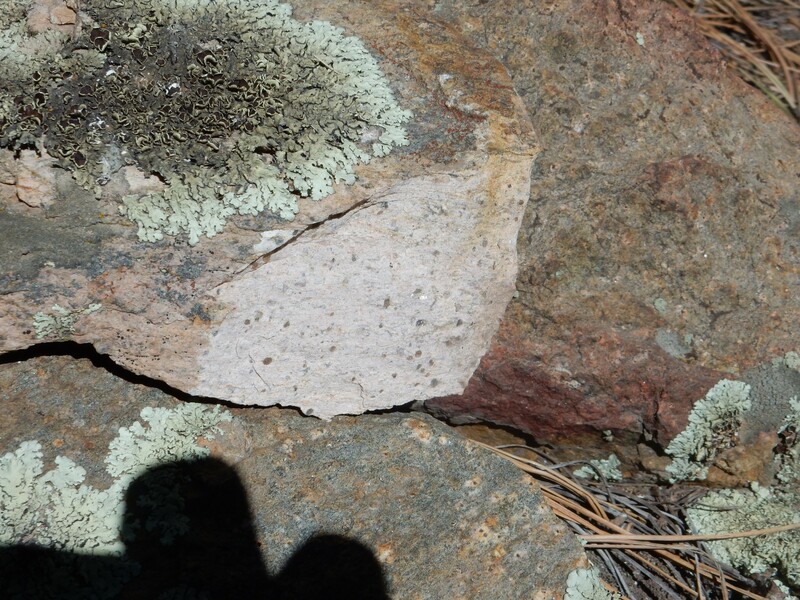 The conclusion is that the white stuff that got buried in the red rhyolite was heated to its melting point. 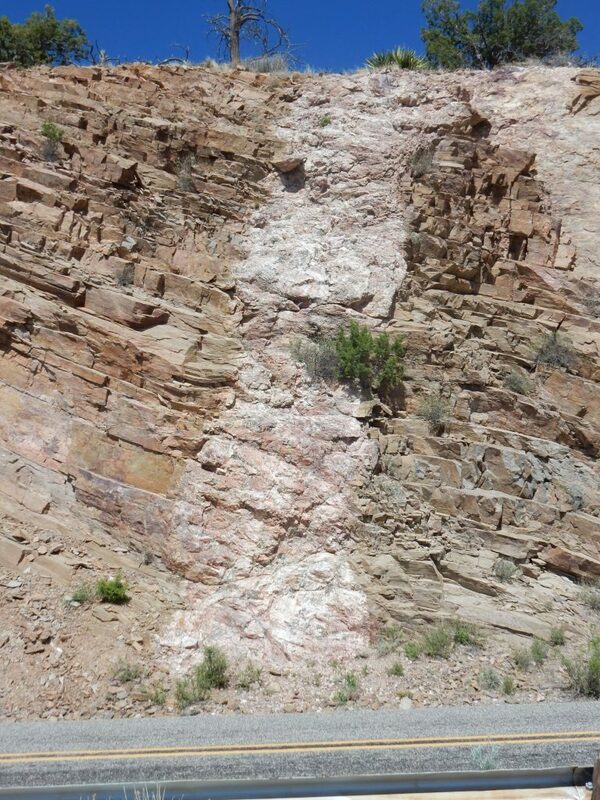 These flows were erupted across the flat Precambrian surface of the mesa. 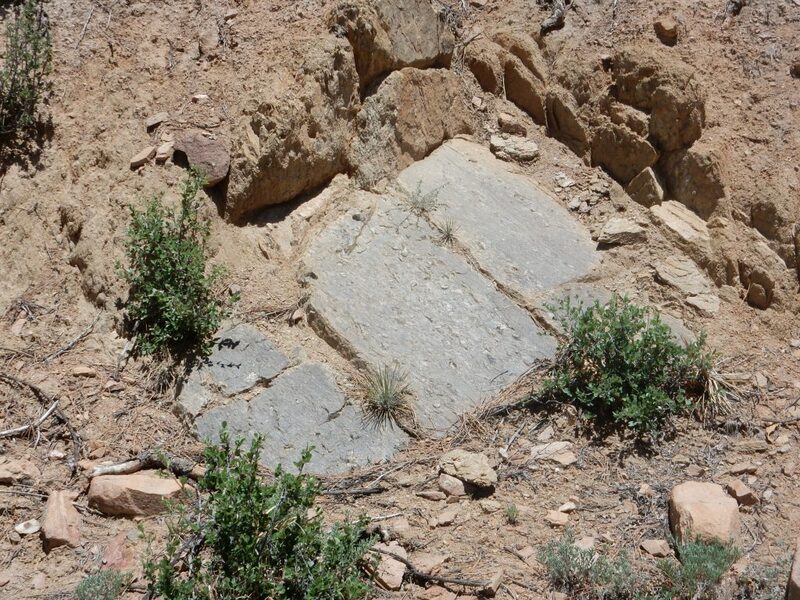 This surface probably was an old erosional surface, at least 25 million years old, where the rock was beveled flat before being subsequently uplifted. 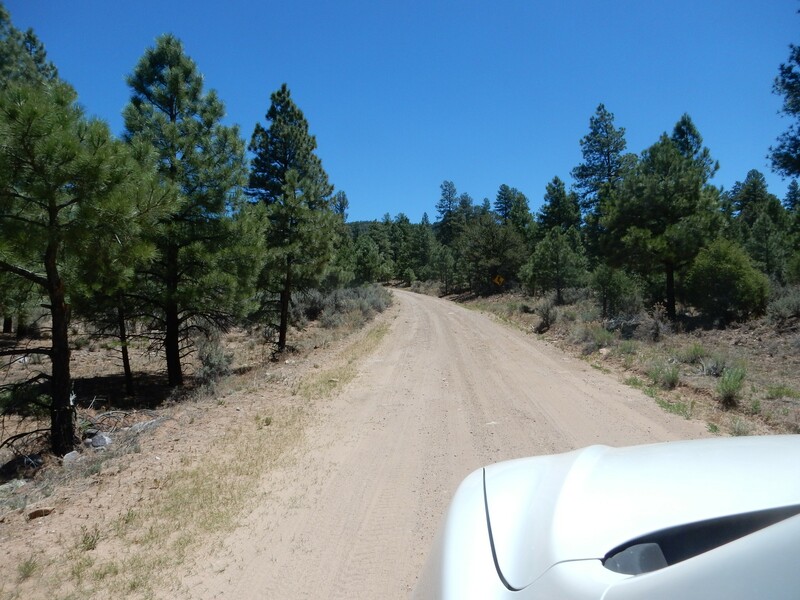 I return to the main gravel road and head southeast. The road passes some Petaca Schist. looks a lot like schist. Perhaps my navigation was off; but the map shows this as Petaca Schist all right. On the other hand, the report with the map notes that the Petaca Schist is pretty heterogenous. 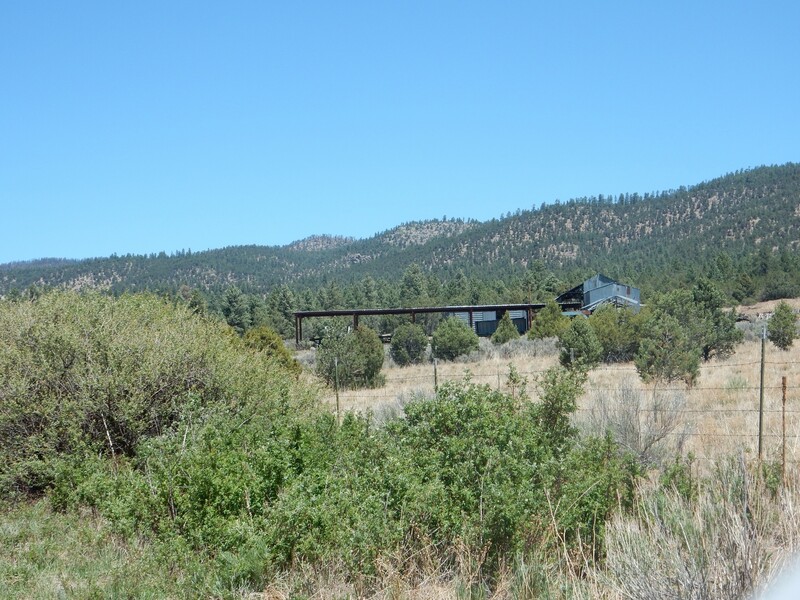 The next to last stop in the log is the Apache Mine. I start down the road and hit what looks like a fork; neither is inviting. The left fork fades to grass and the right becomes pretty gnarly. The right fork turns out to be the correct one; the mine is here. The road log warned that the road became even worse further down. 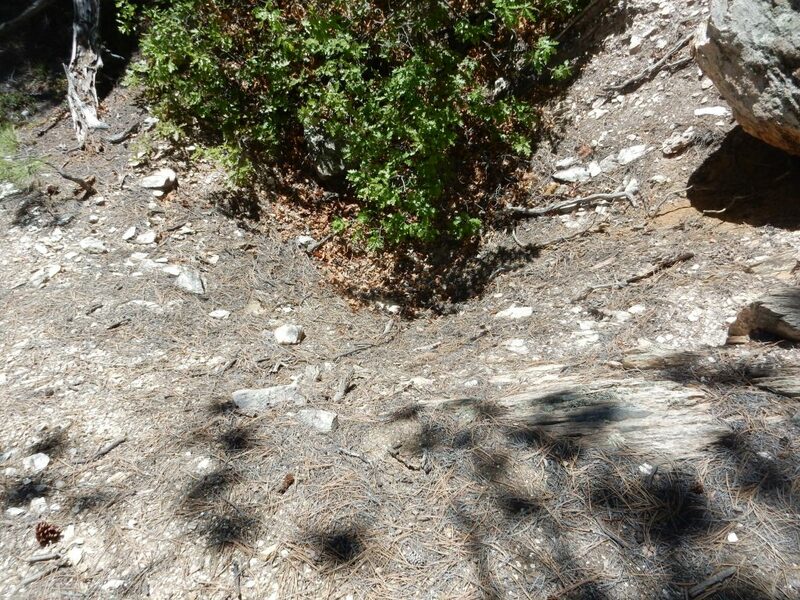 I refrained, not wishing to break an axle this deep in the mountains, and not having time to hike down the road. Even though pegmatite mines can be way cool. Further down the road, Petaca Peak comes into view. I do not have a good geologic map for the quadrangle to the east, but I’m guessing Petaca Peak is a source vent for the Dorado Basalt, part of the Servilleta Basalt and about 4.4 million years old. Some of the youngest rocks we’ve seen today. The basalt flows cover the distant mesa. While on this mesa the road cuts into some more of the older Jarita Basalt. This stuff is about 24 million years old. I was soon back onto the paved highway, in the little town of Petaca, and started home. I was off my log, and just enjoyed the sites. Which included what looked like a fault trace. Checking the geologic map, I find that, sure enough, it shows a fault here, though it does not name the fault. The road log identifies the beds here as the Cordito Member of the Los Pinos Formation, another Santa Fe Group formation. The displacement here brings different levels of the formation against each other; the displacement is not enough to juxtapose different formations. Further down the road are a couple of old friends. A couple of fine pegmatite dikes in metarhyolite similar to that underlying Cerro Colorado. 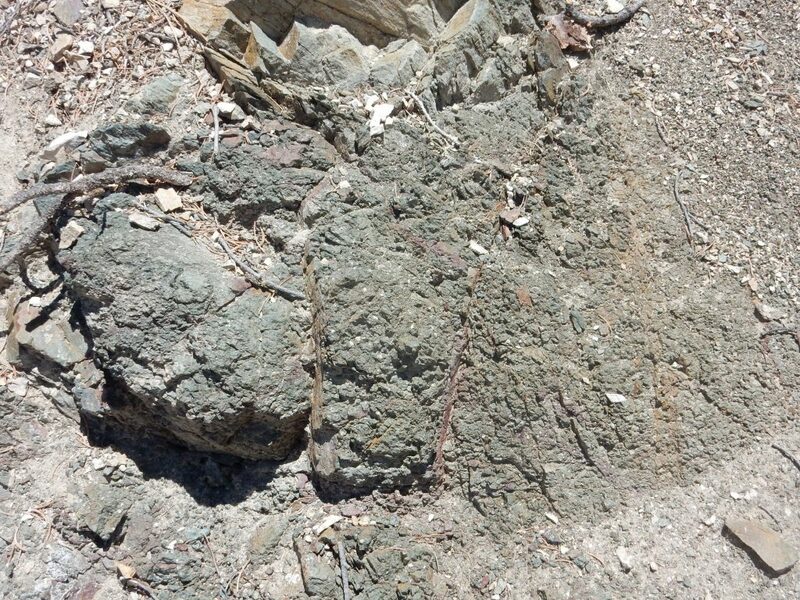 Some pegmatites have commercially valuable rare ore minerals. 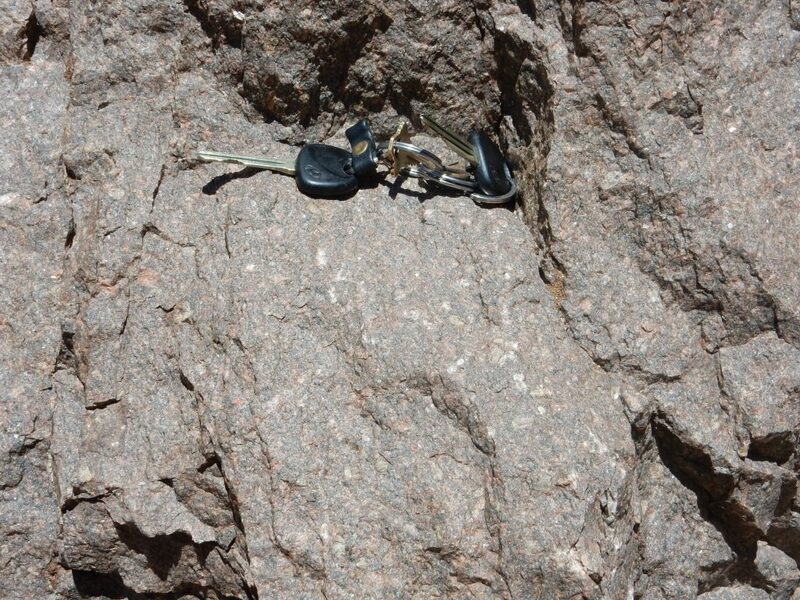 These dikes are a fairly simple pegmatite, with little more than feldspar, quartz, and mica. I was first introduced to these a few years back when returning from a different road log in the Tusas. I still like looking at them even if they don’t contain any particularly unusual minerals. 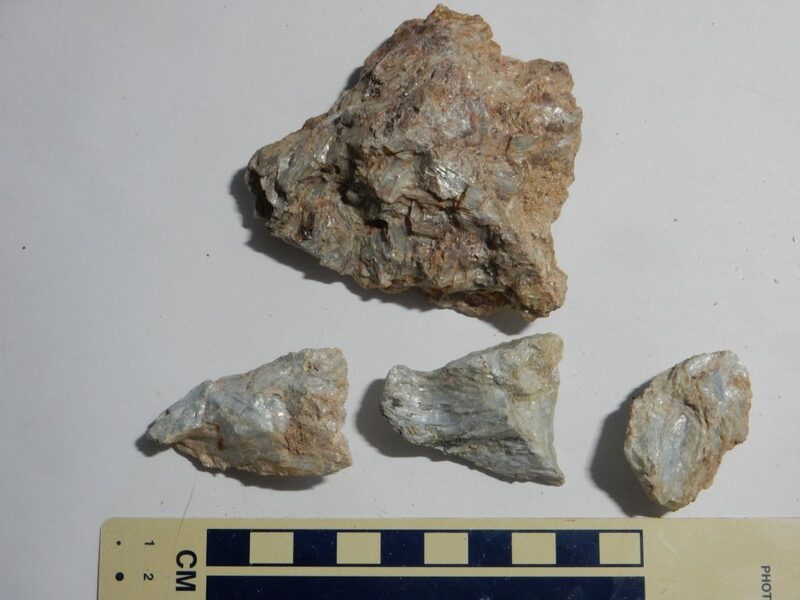 Pegmatites rich in mica are common in the Tusas and probably date back to about 1.4 billion years ago, when some mysterious heating event produced granites and pegmatites throughout the Southwest. Those in the Tusas are rich in mica, and some locations had mica “books” (individual crystals) up to several feet across. These had a number of commercial uses, but mining ceased due to reduced demand and competition from mica mines in the eastern United States.